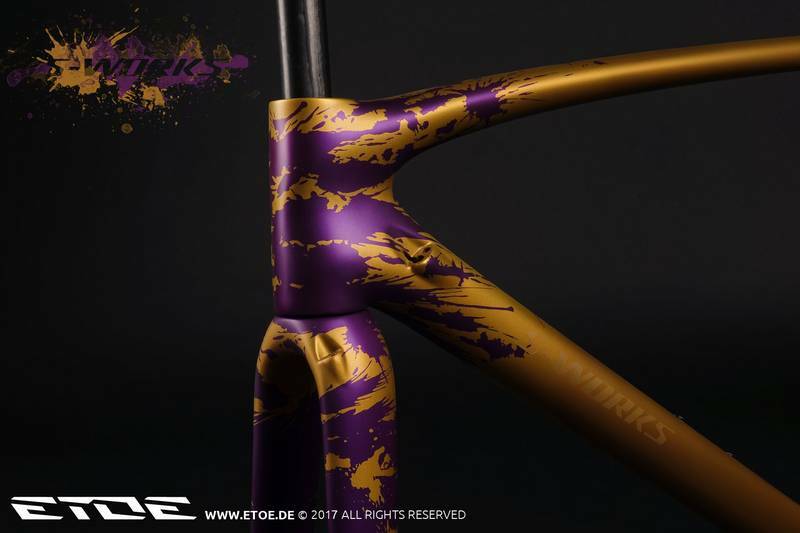 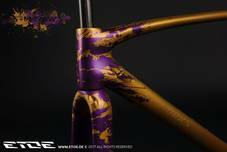 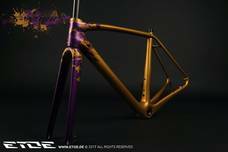 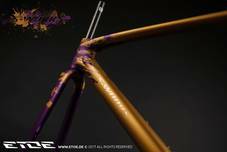 Gold and purple on a Specialized Tarmac carbon frame. 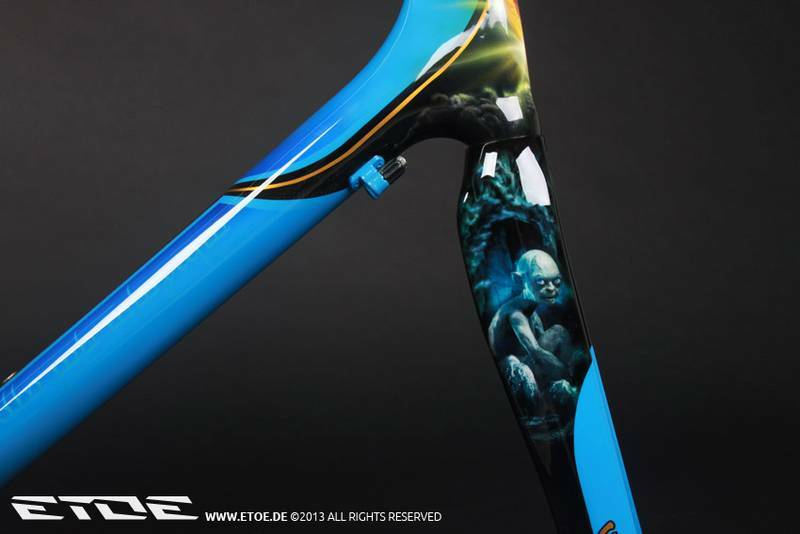 Color carried by light flows on paths that lead to the soul. 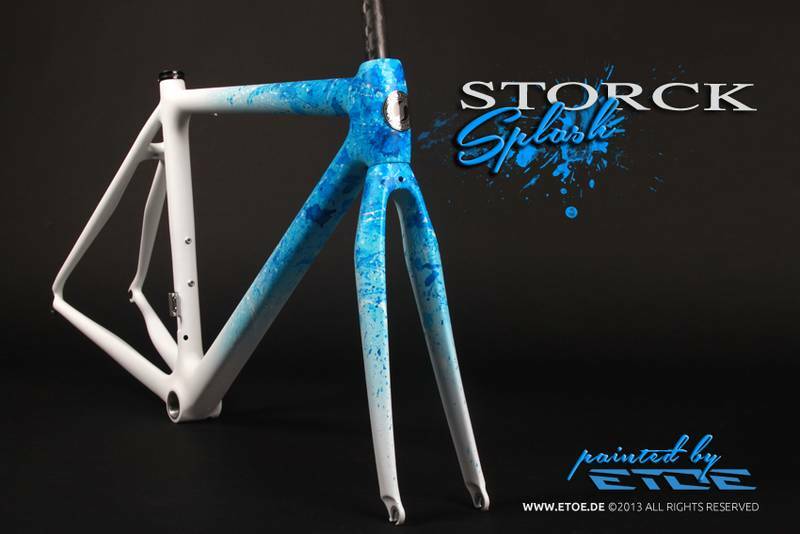 Paint job with change of color. Depending on temperature the color changes. 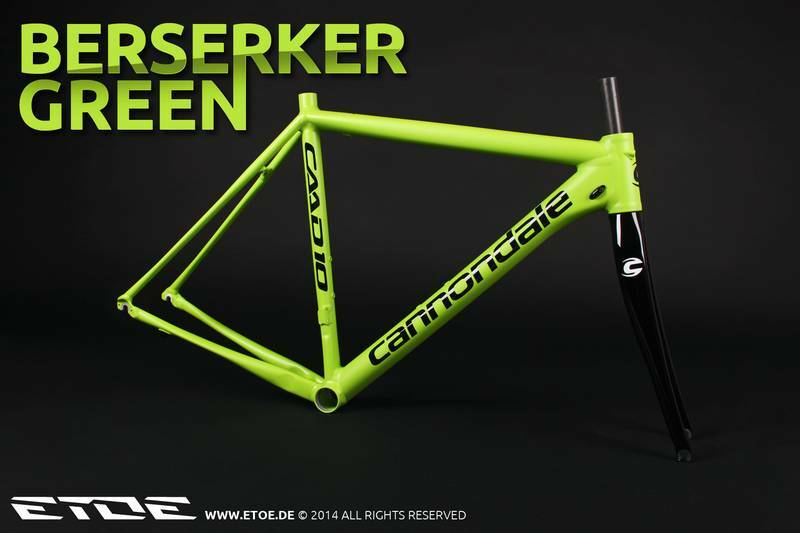 The warmer the surrounding, the lighter the shade of green. 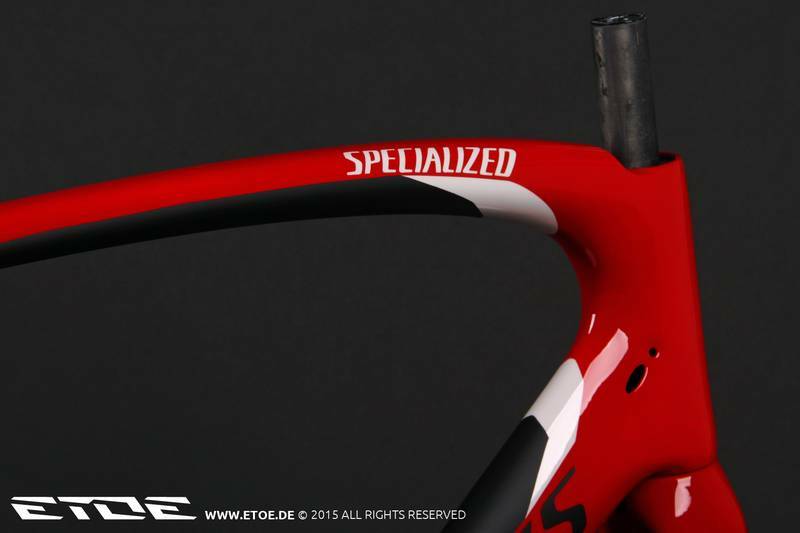 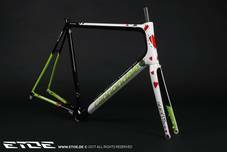 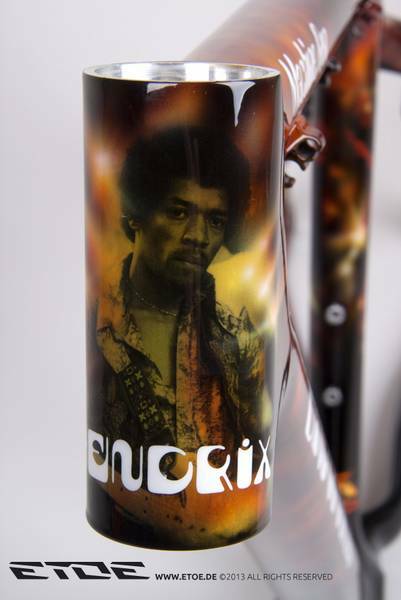 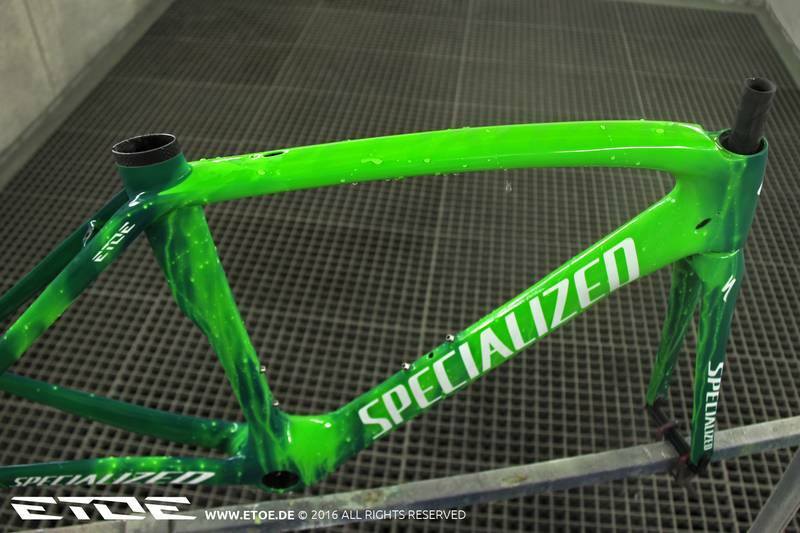 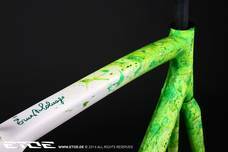 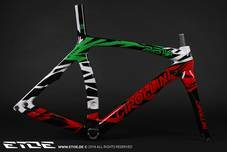 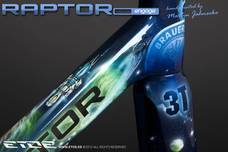 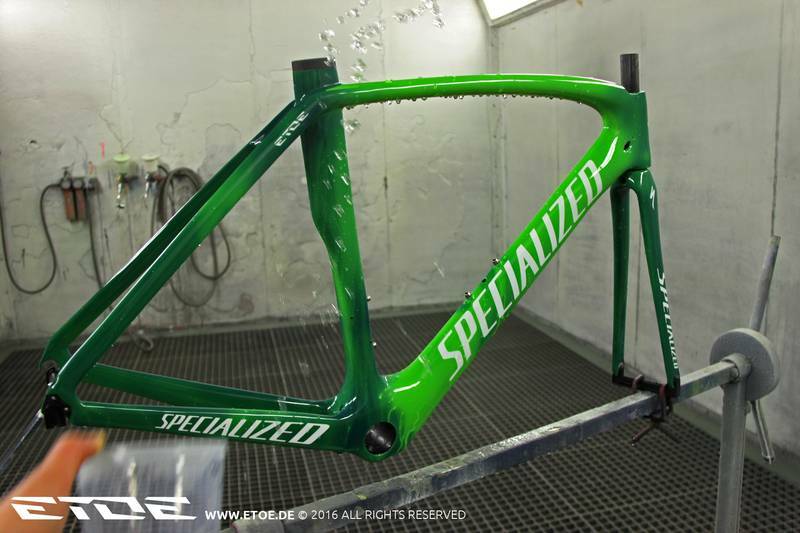 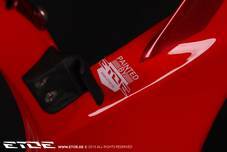 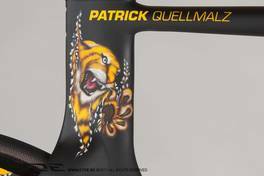 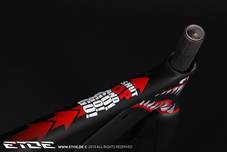 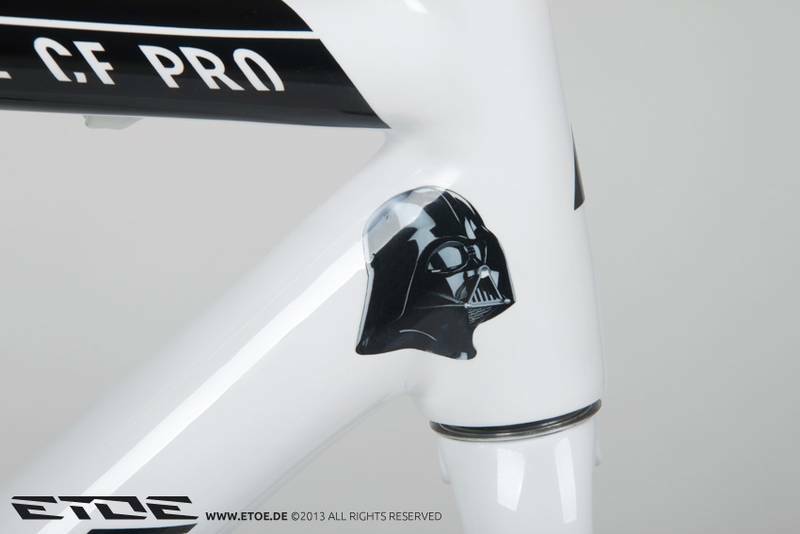 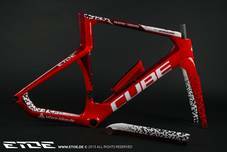 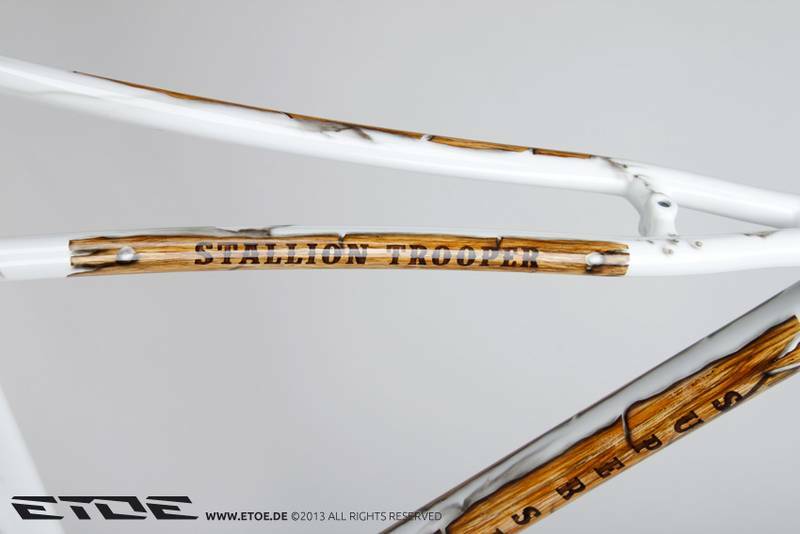 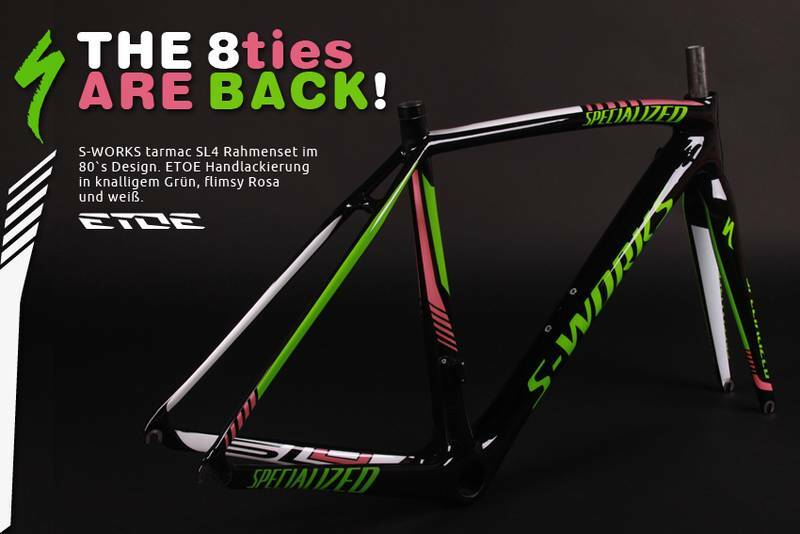 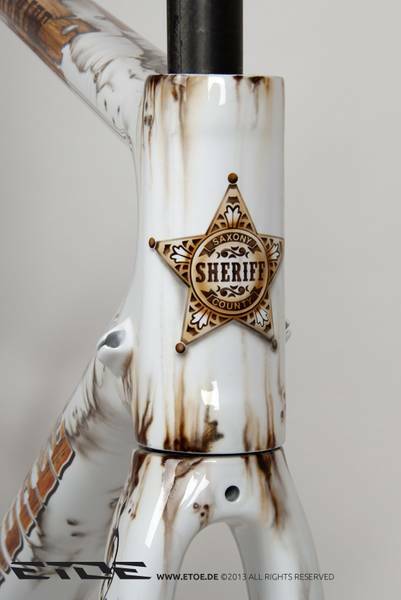 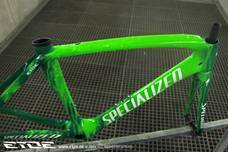 Specialized also uses this paintwork for their Olympic frames. 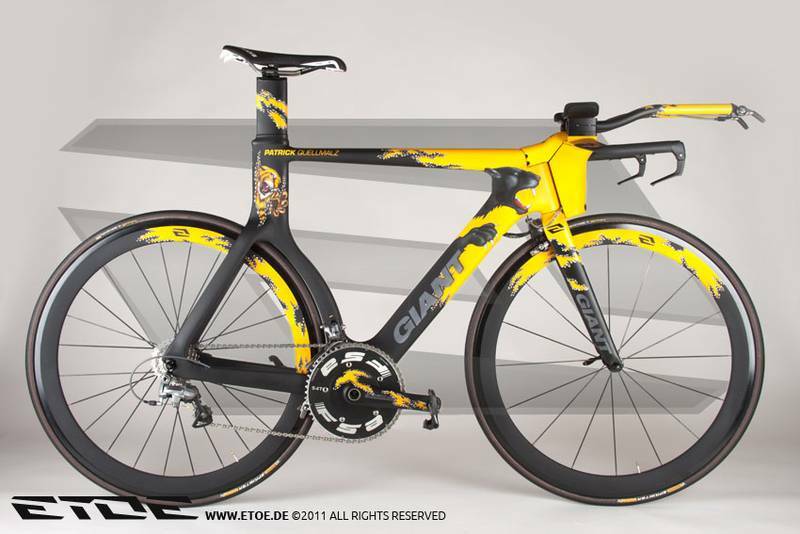 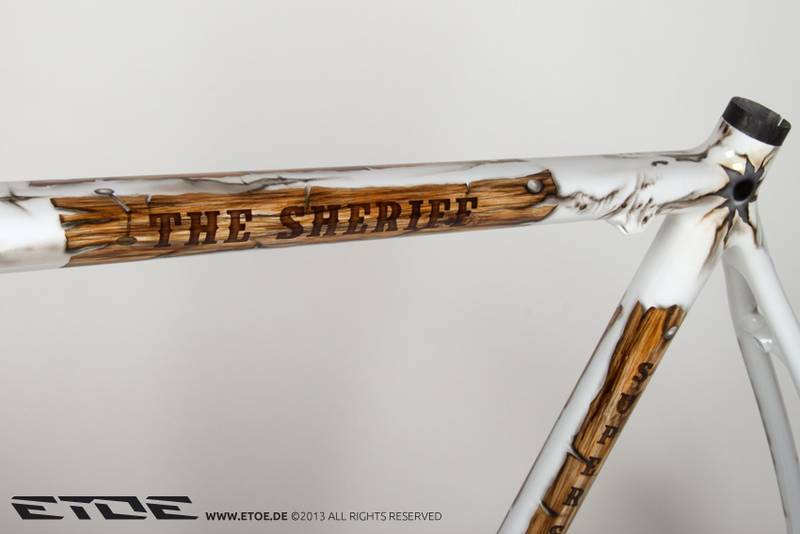 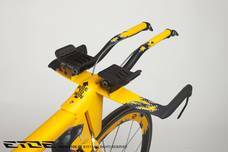 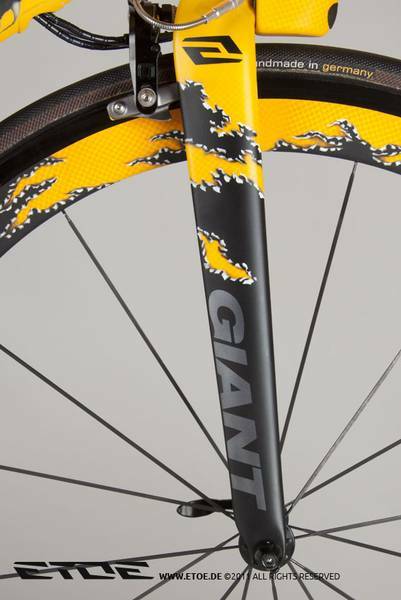 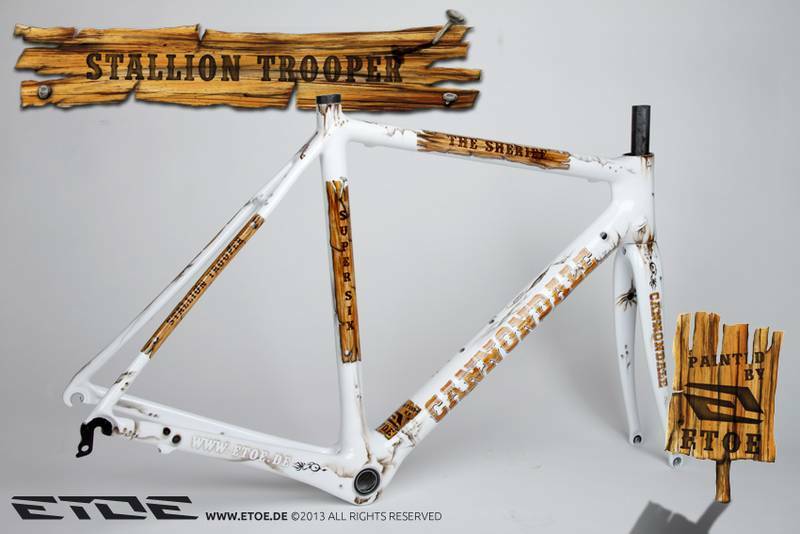 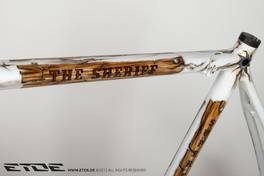 They are called "Olympic Torch"
The designer Martin Grey shows this effect on a carbon frame. 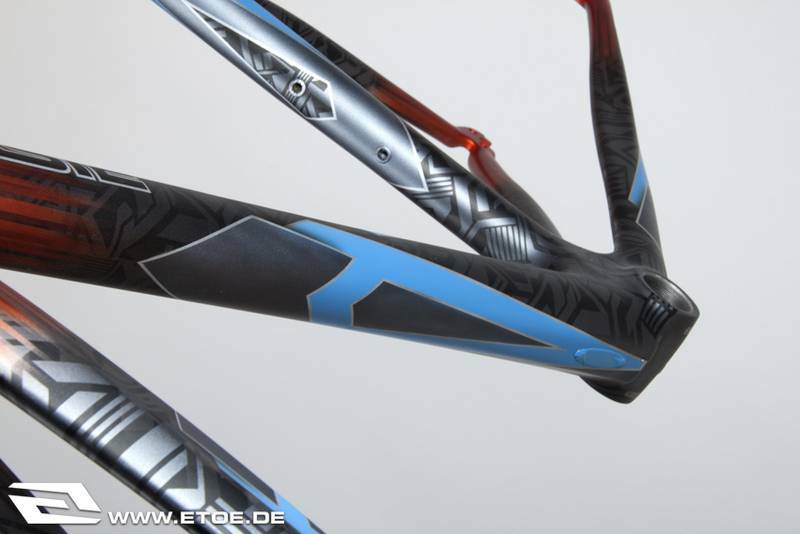 Design in different shades of black with matt or gloss grade. 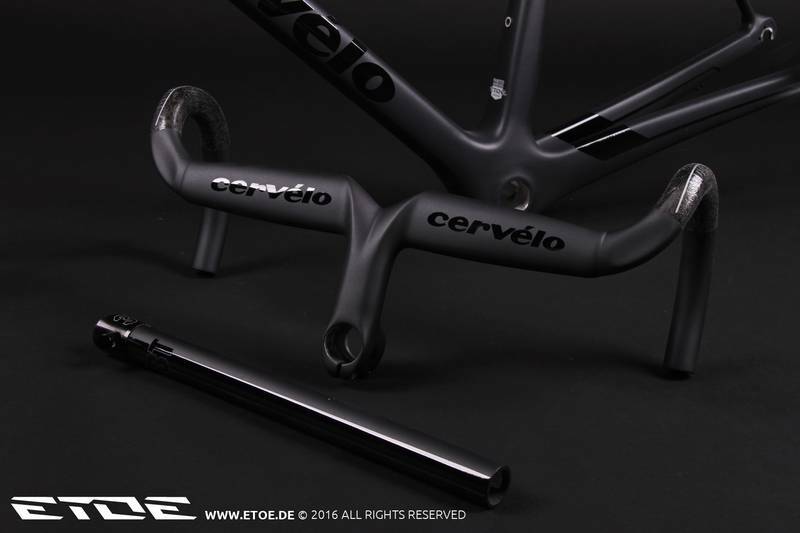 All Black, Magic Black, Deep Black - in combination with color - high gloss or matt. 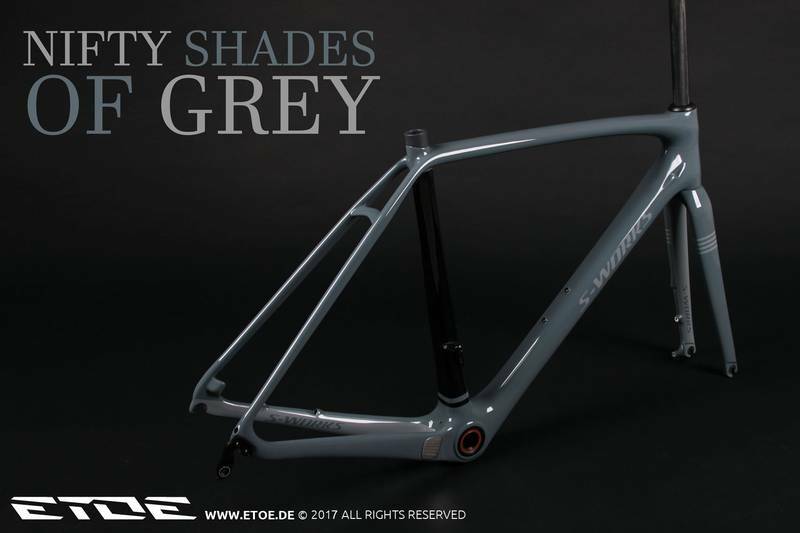 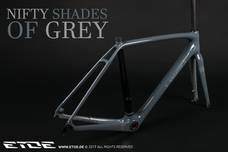 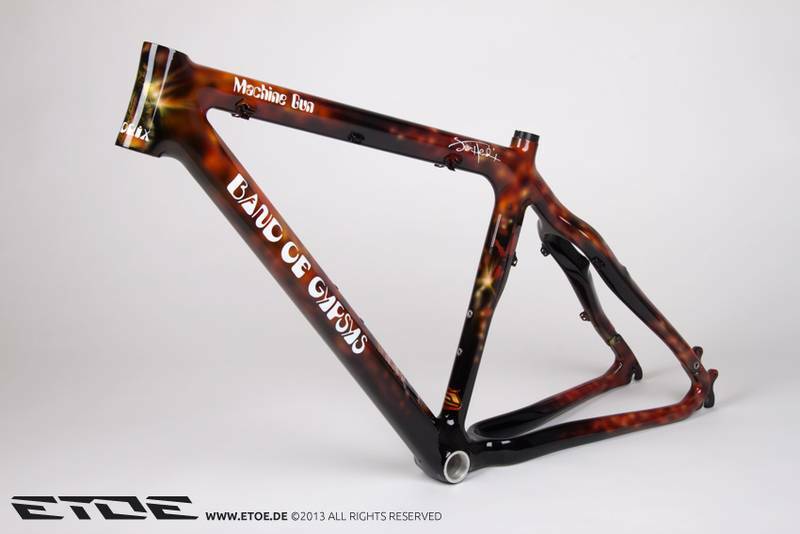 The shown frames are hand painted by the designer Martin Grey. 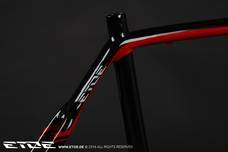 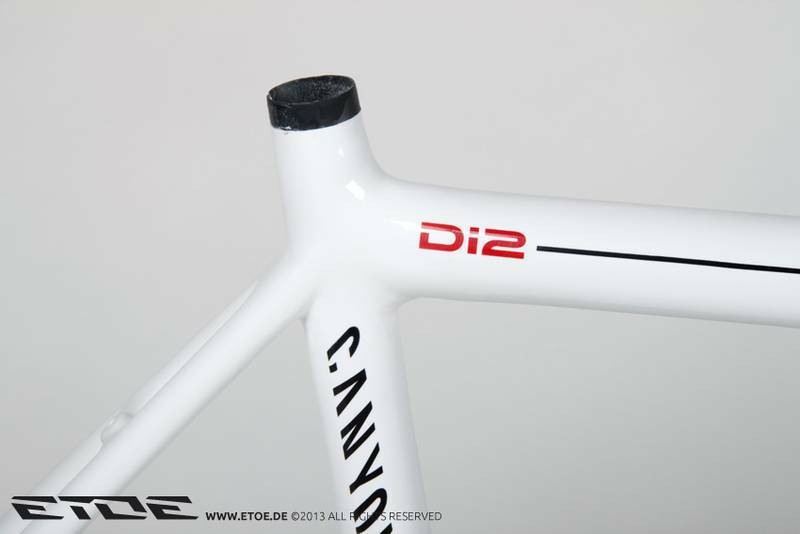 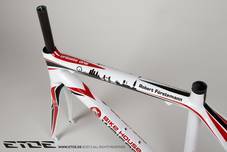 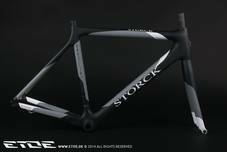 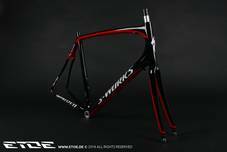 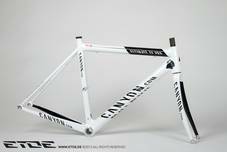 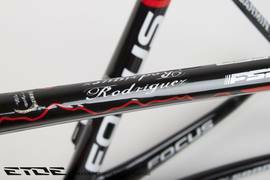 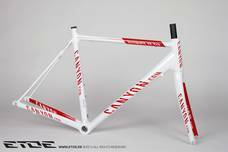 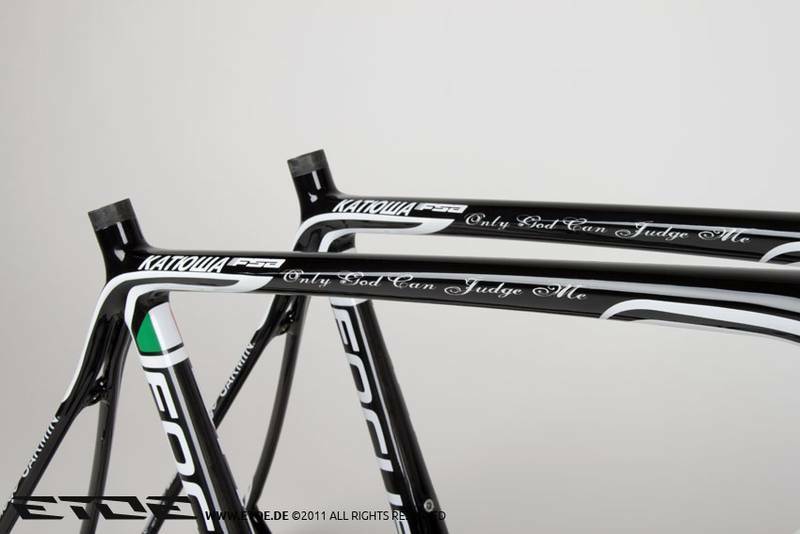 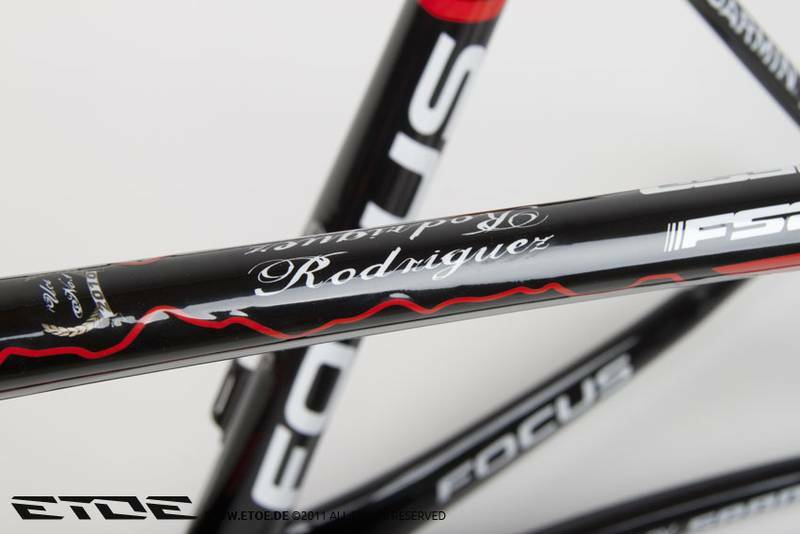 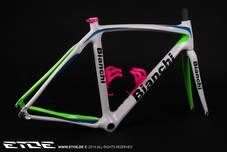 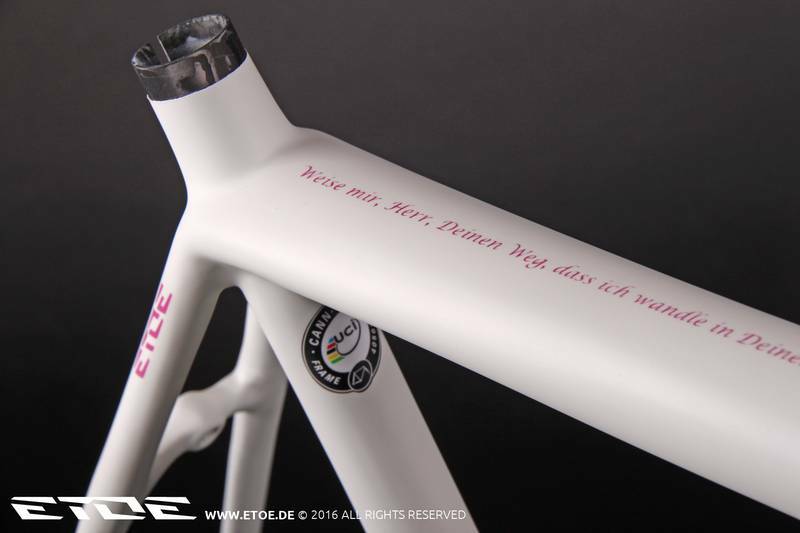 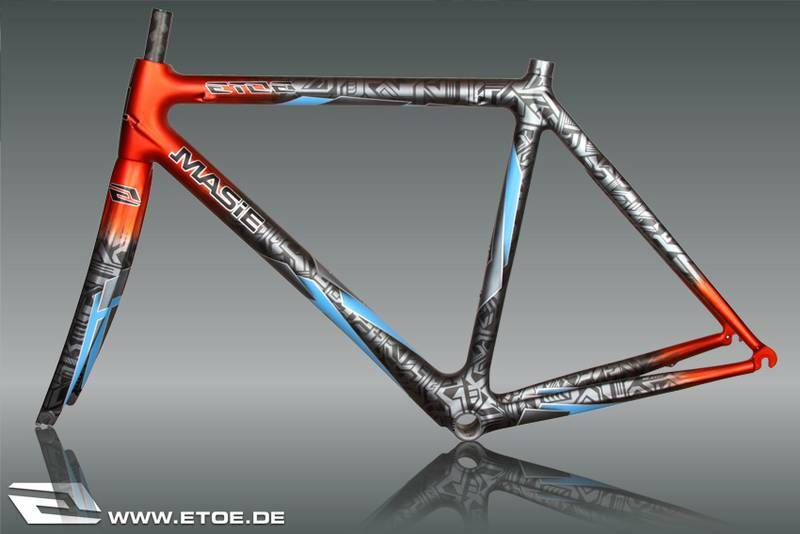 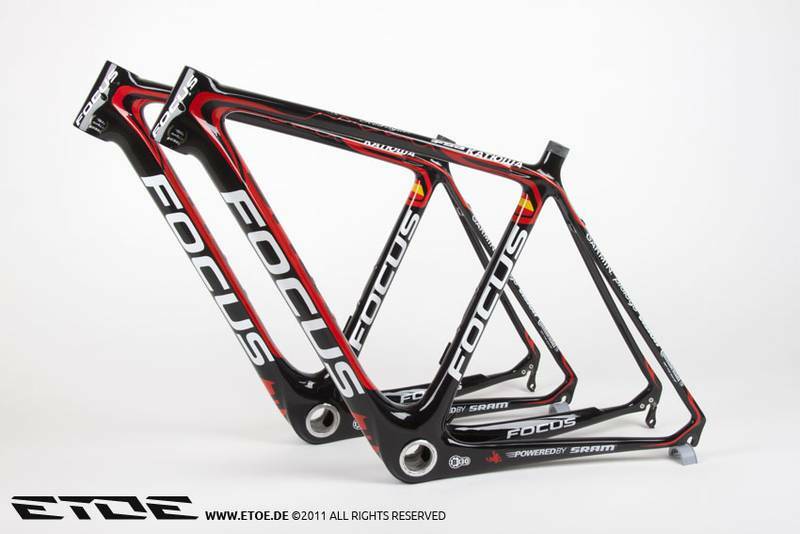 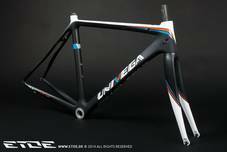 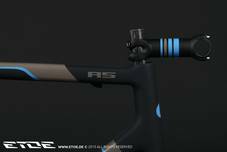 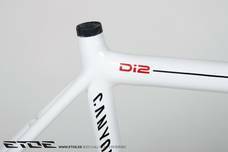 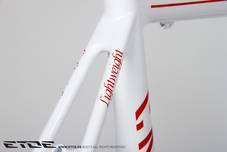 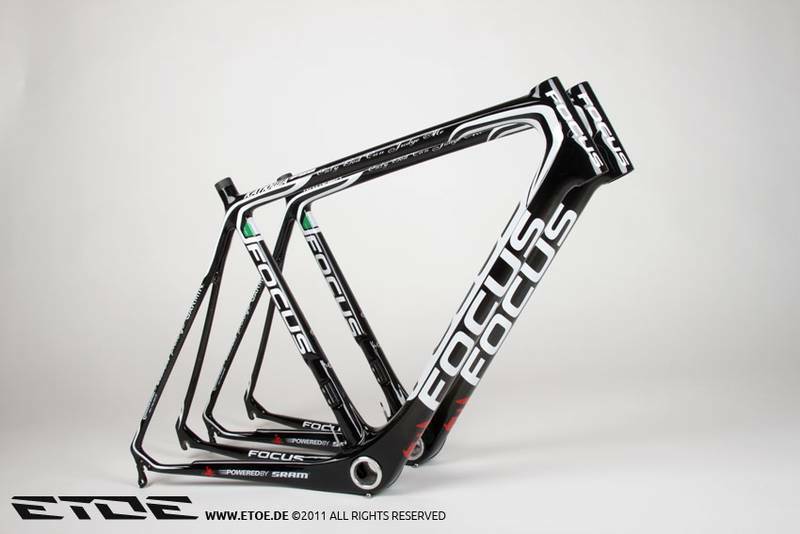 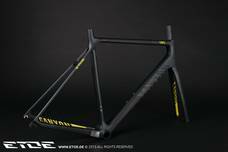 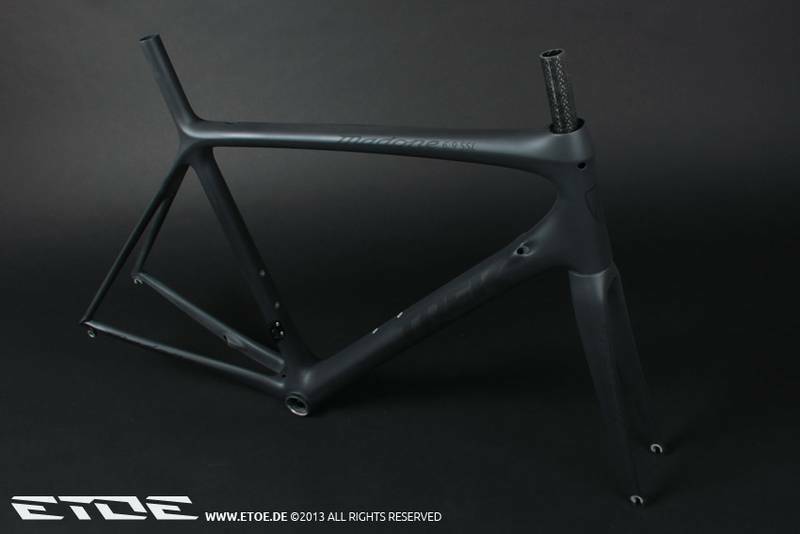 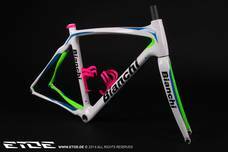 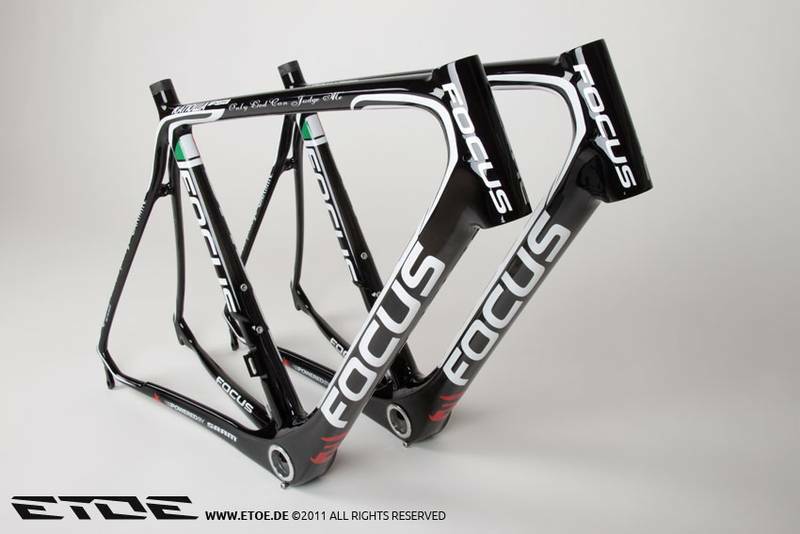 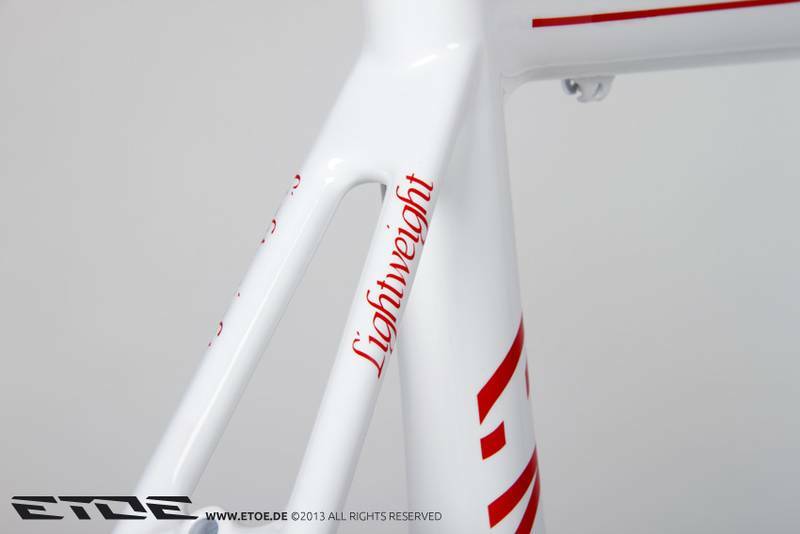 In this gallery you can find frame sets made of carbon fibre with a combination of matt and glossy finishes. 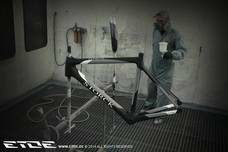 Matt black bike paint is more than a simple coating. 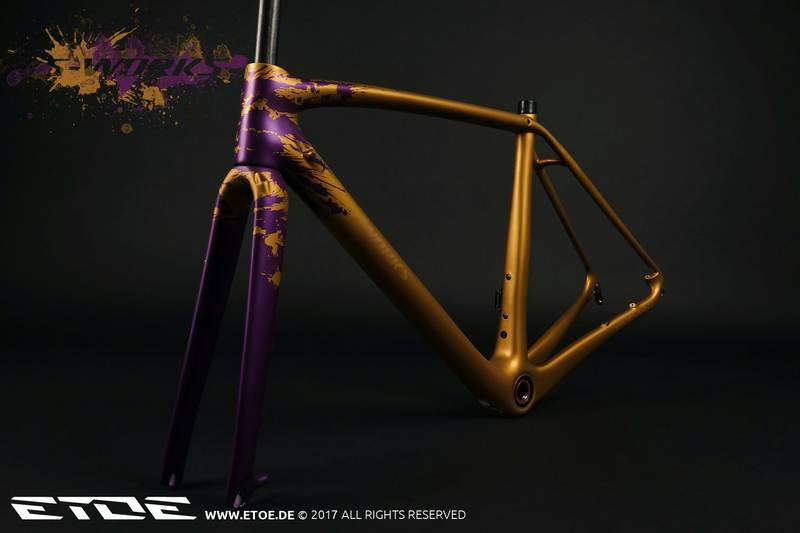 At ETOE the coating consists of high-strength carbon sealer, the chromophoric layers and several lacquer sealings in matt and glossy. 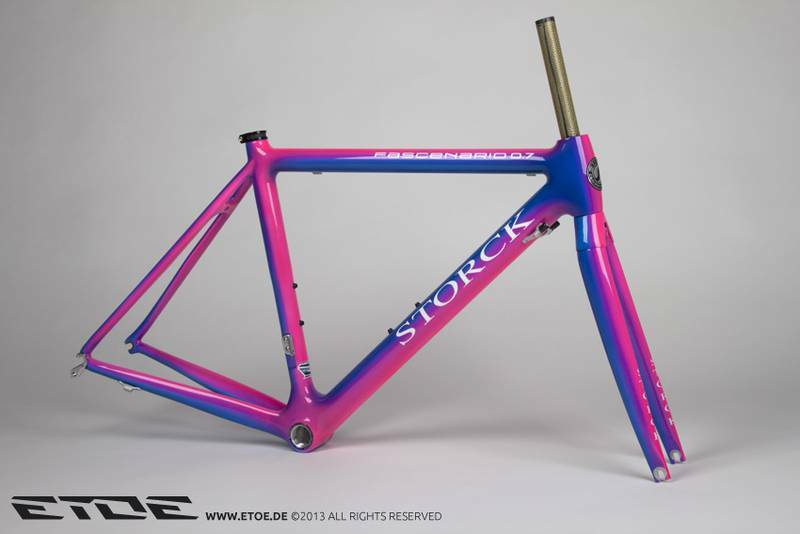 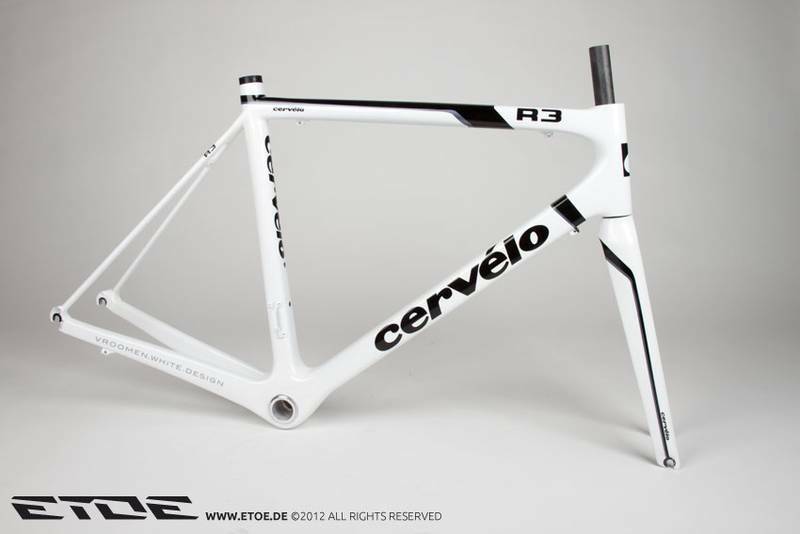 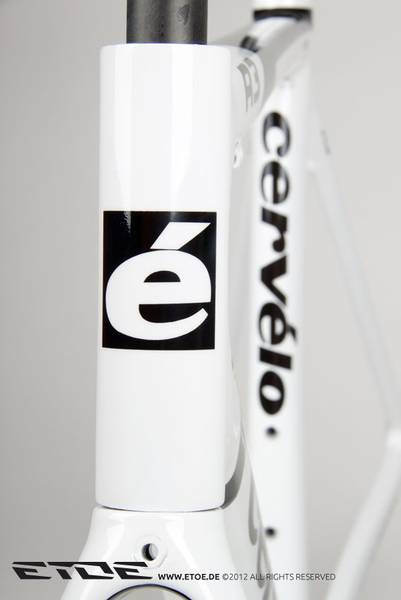 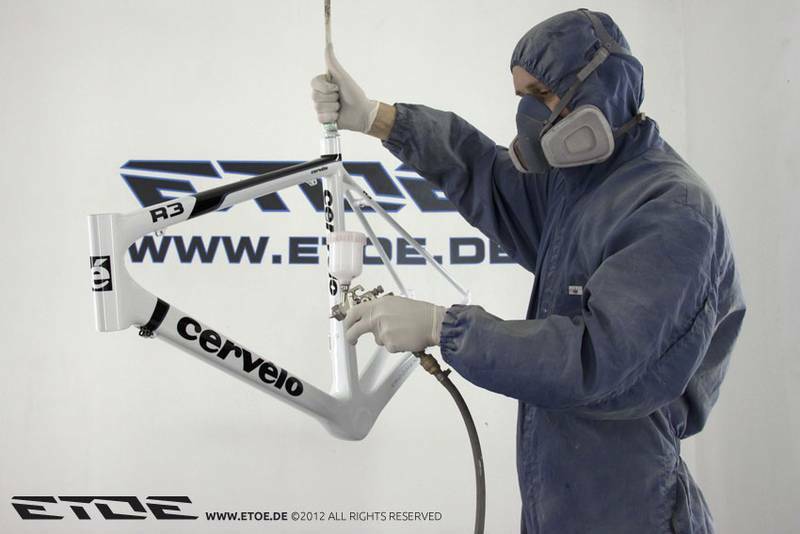 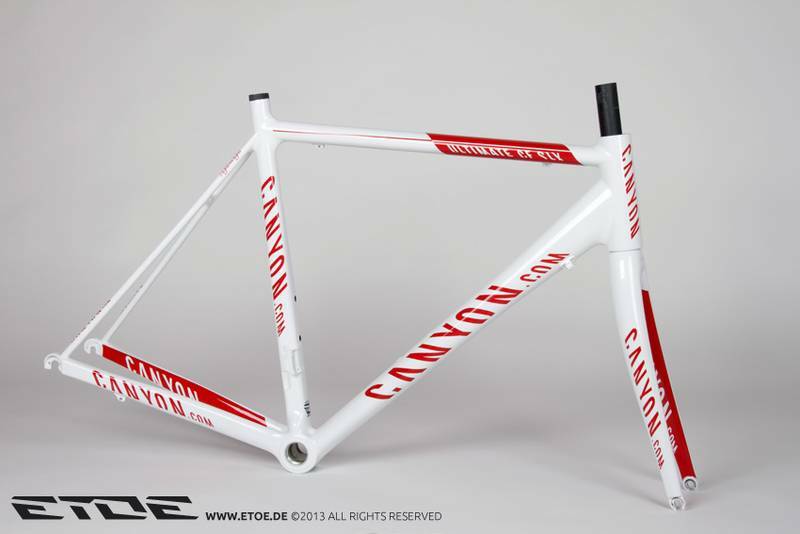 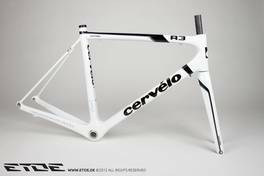 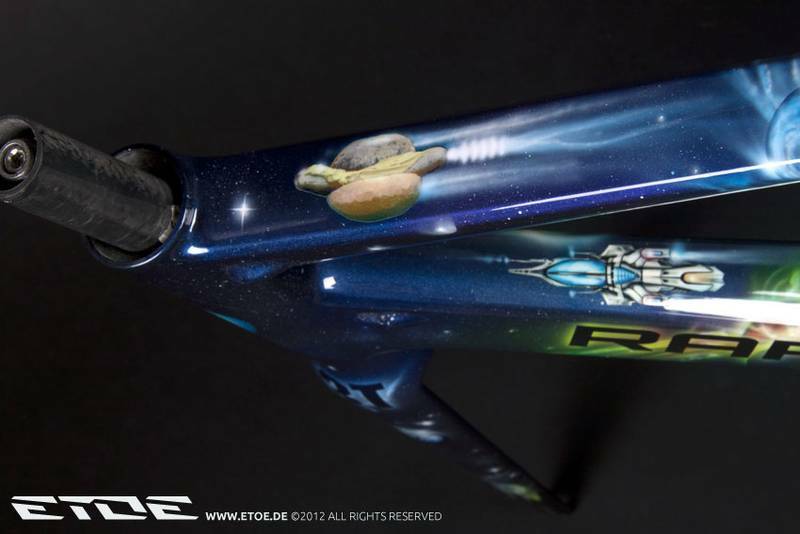 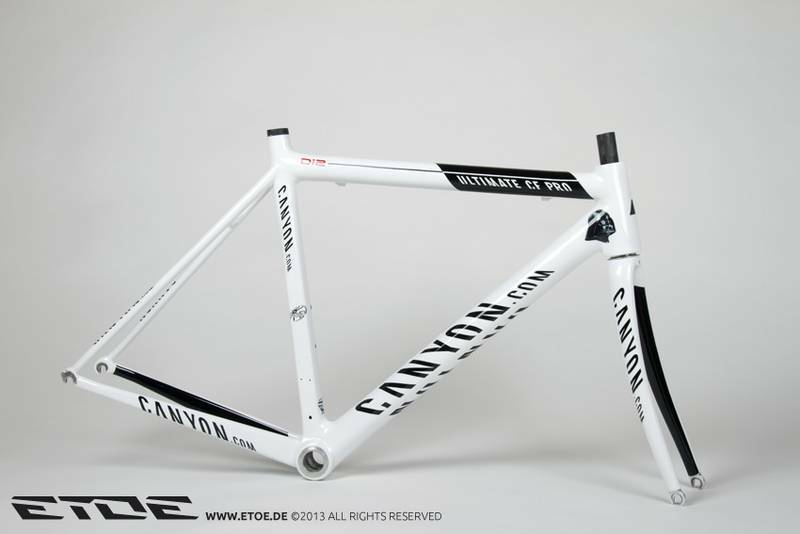 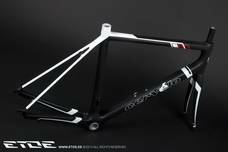 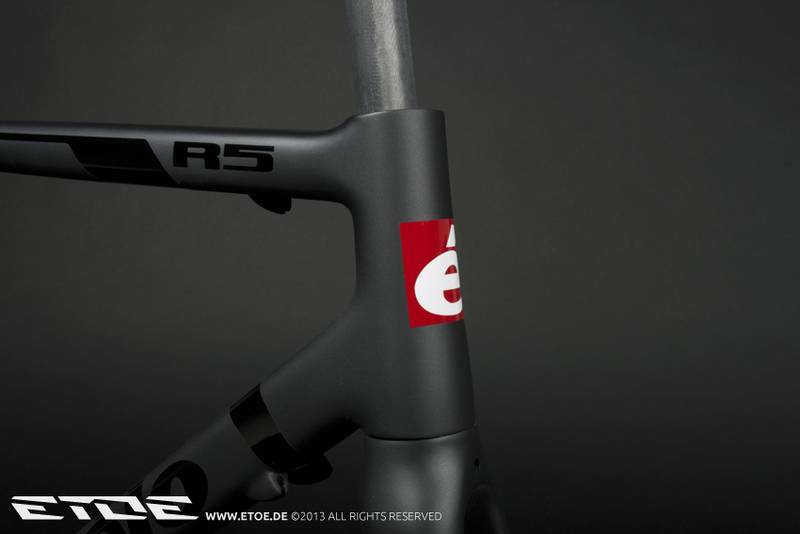 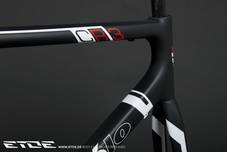 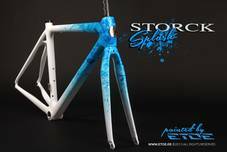 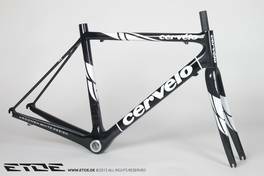 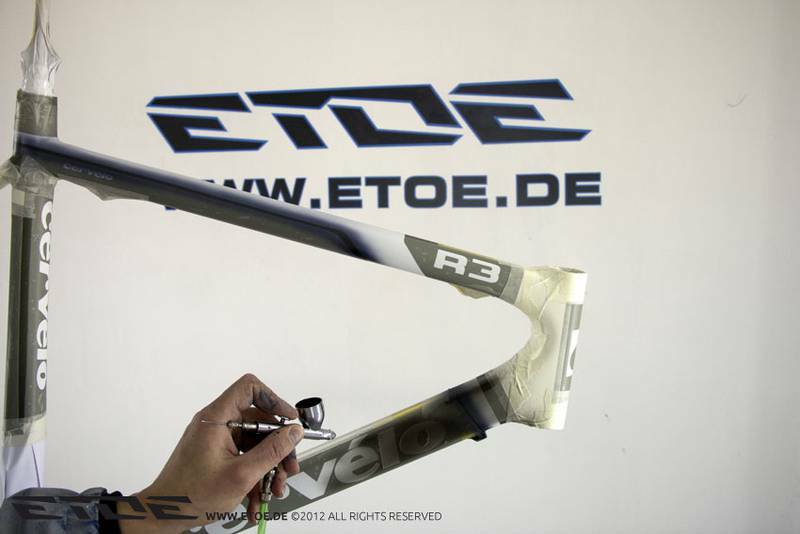 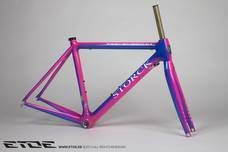 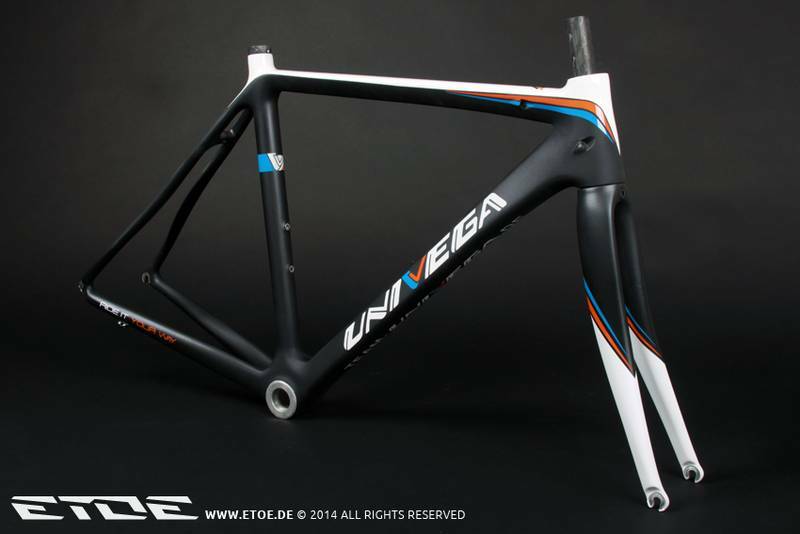 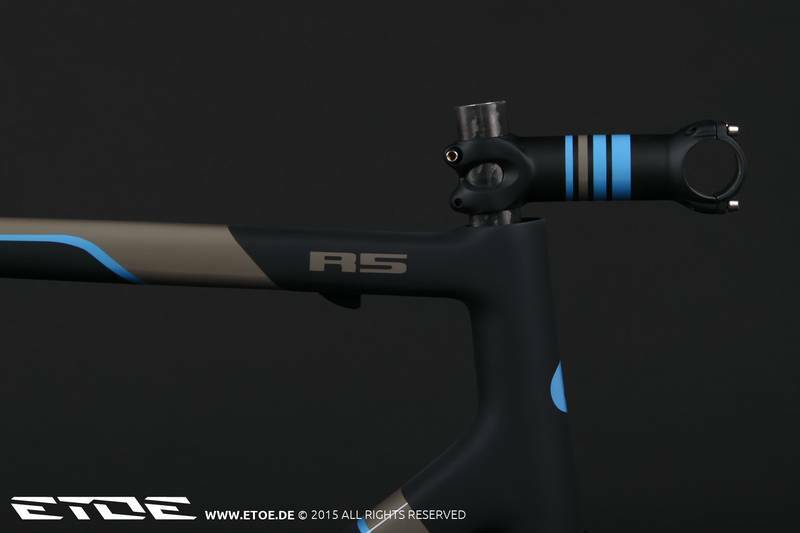 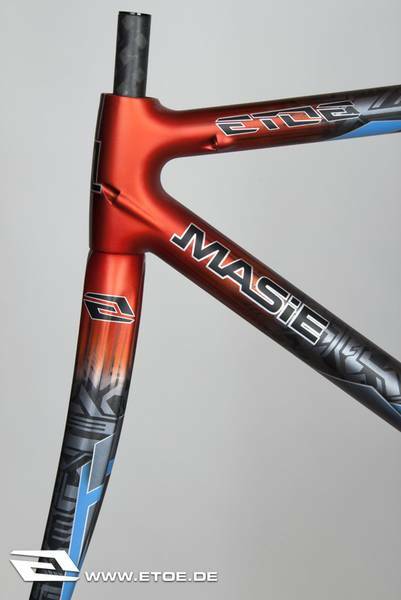 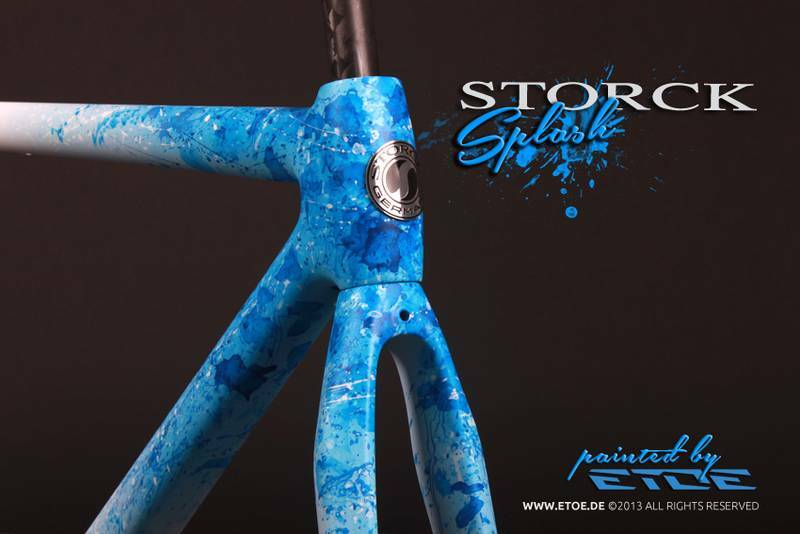 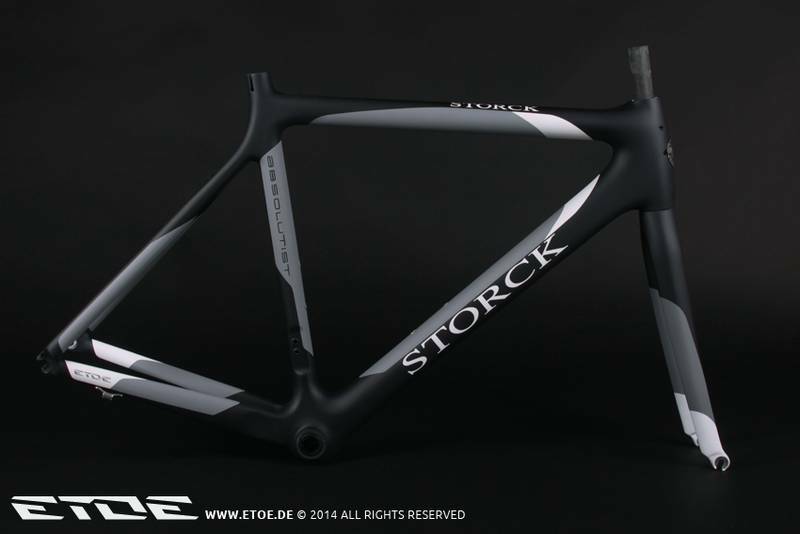 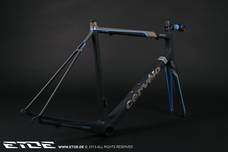 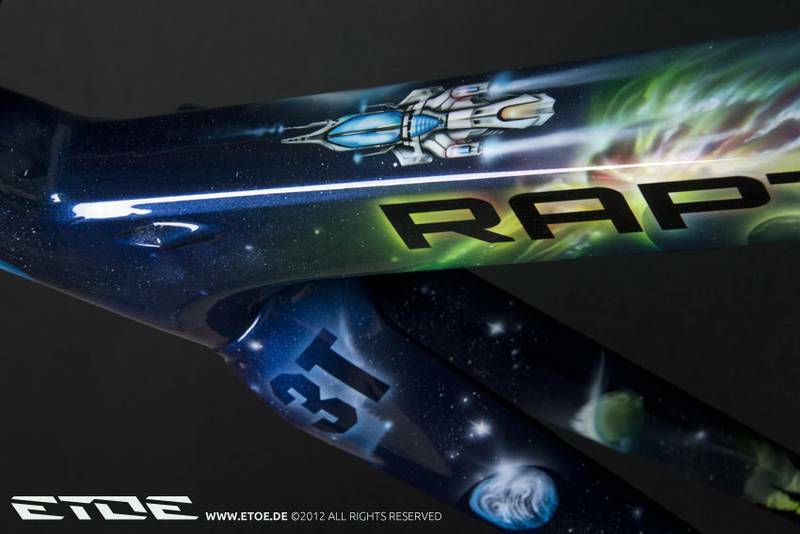 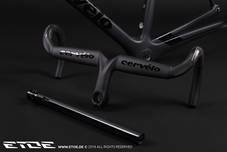 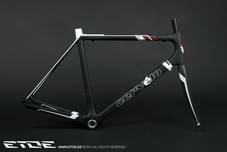 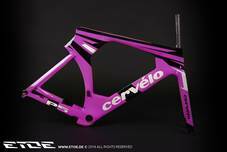 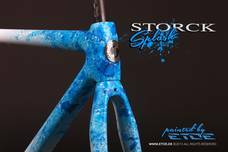 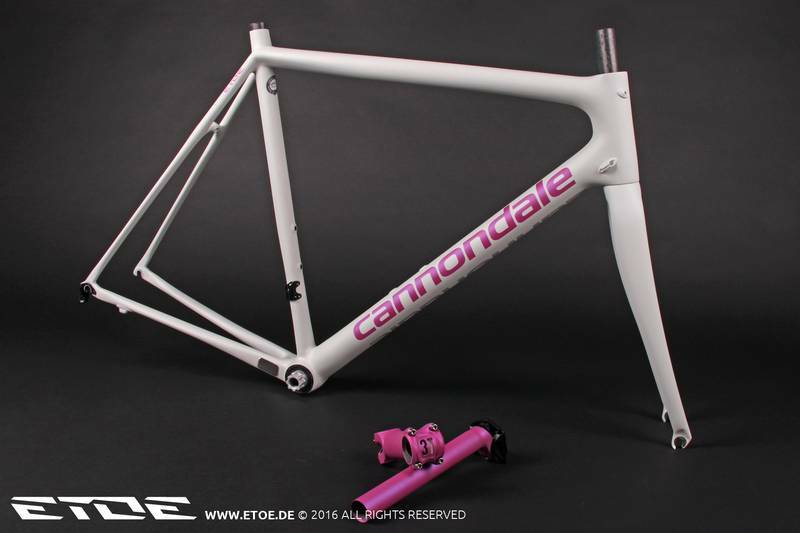 Lightweight paint on a Cervélo R5 frame. 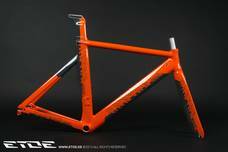 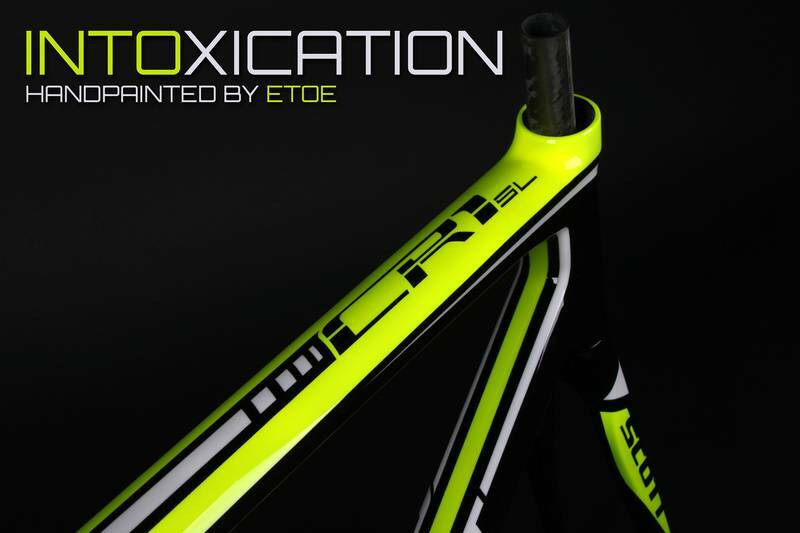 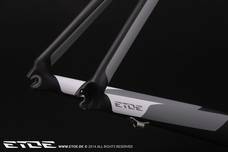 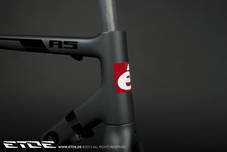 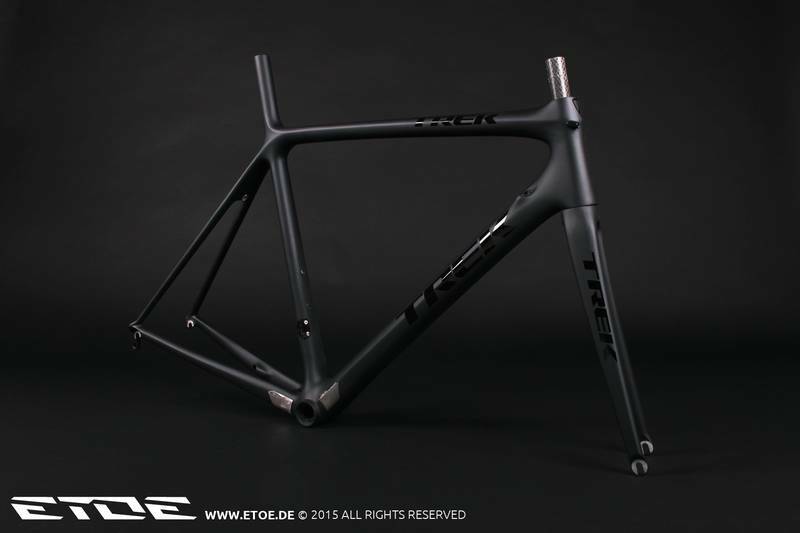 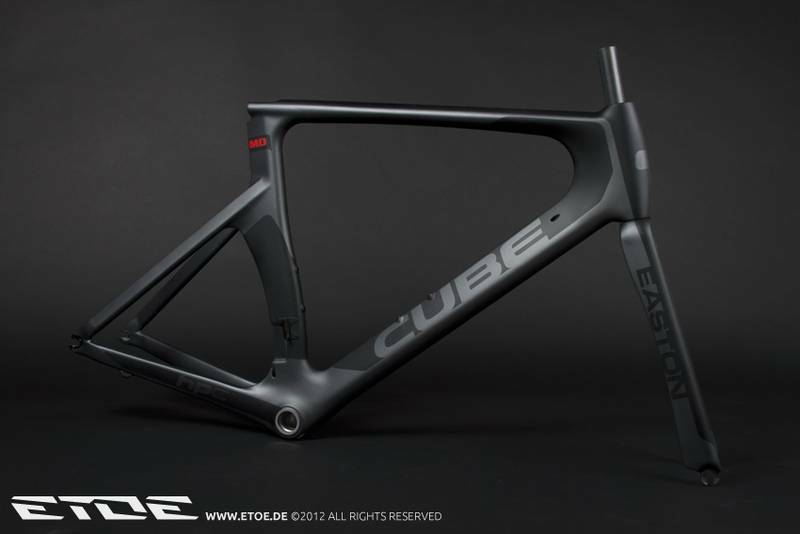 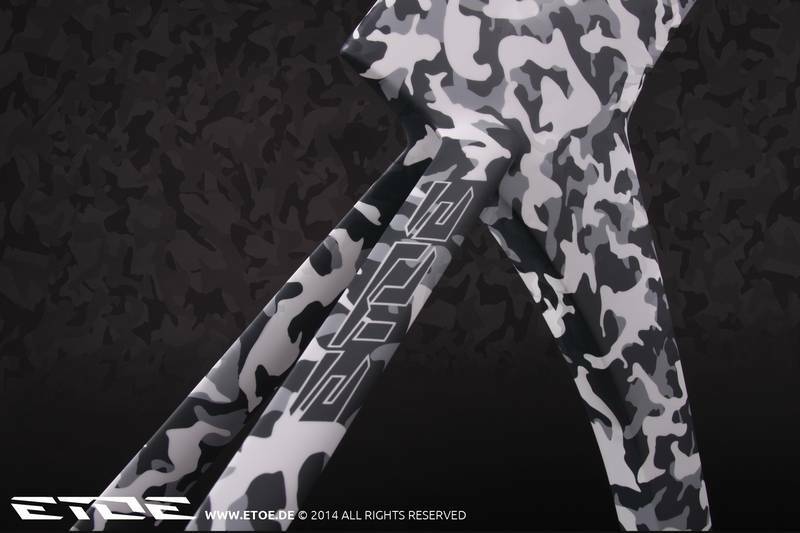 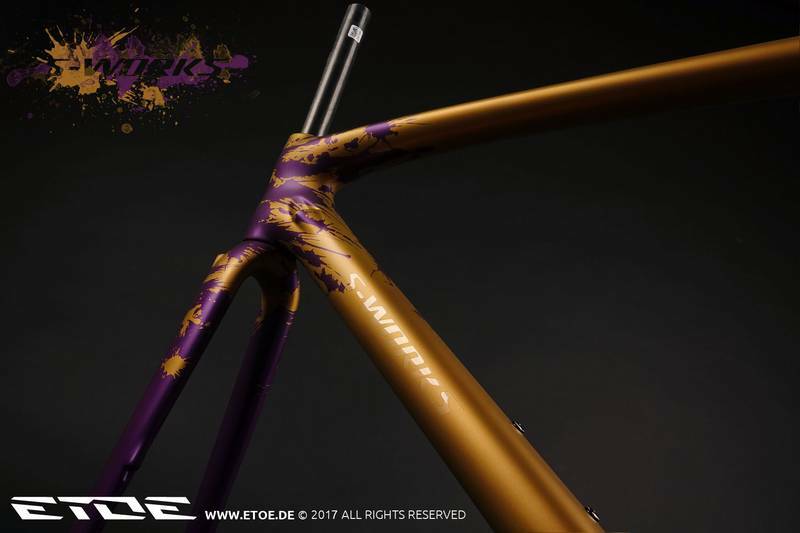 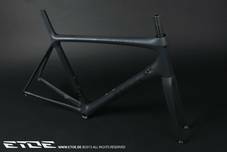 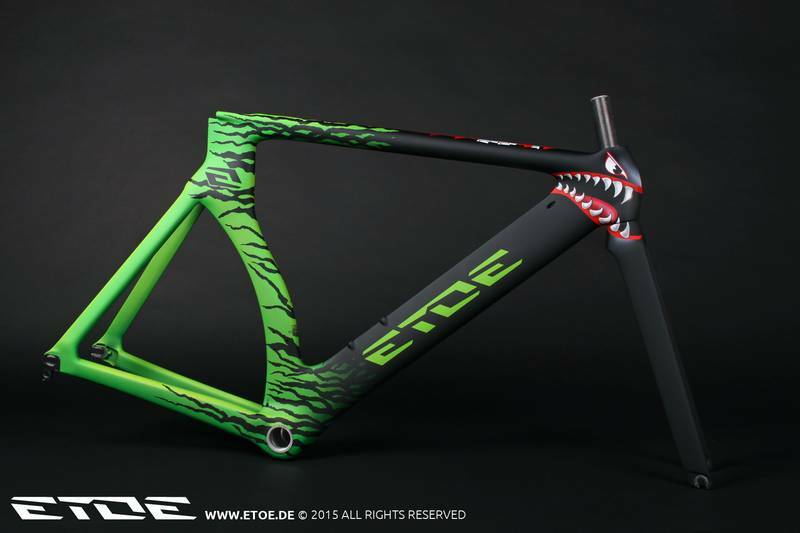 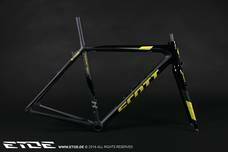 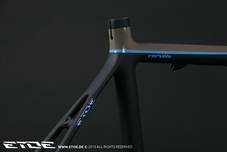 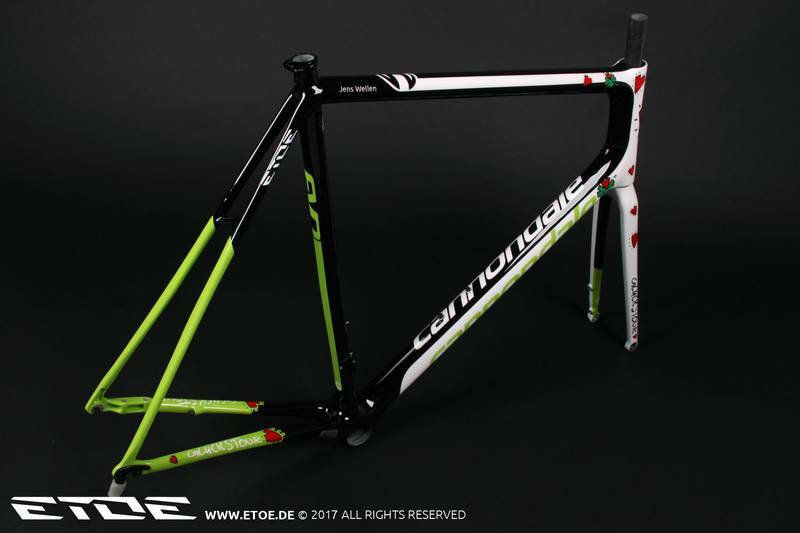 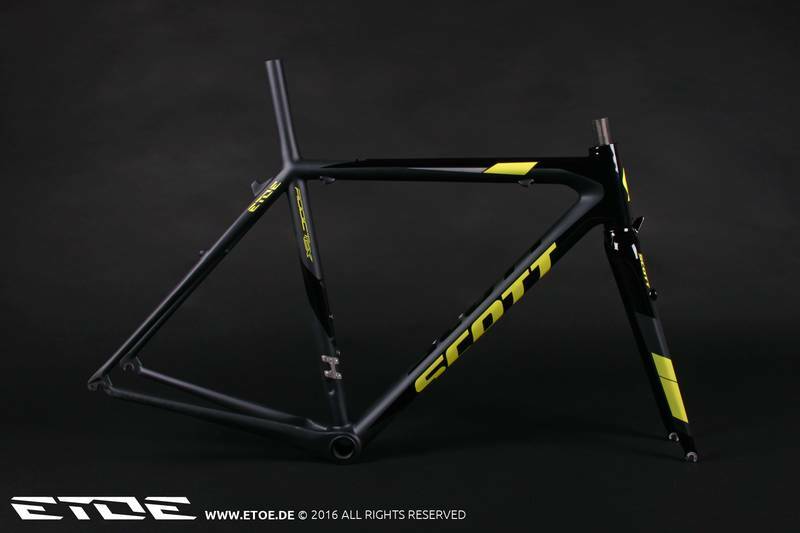 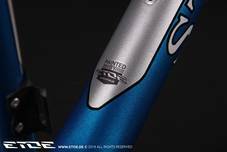 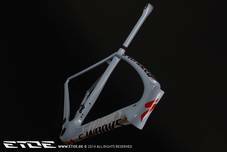 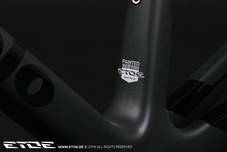 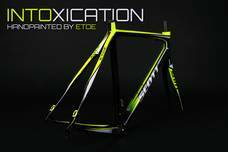 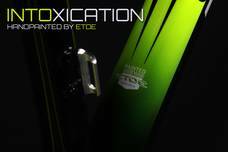 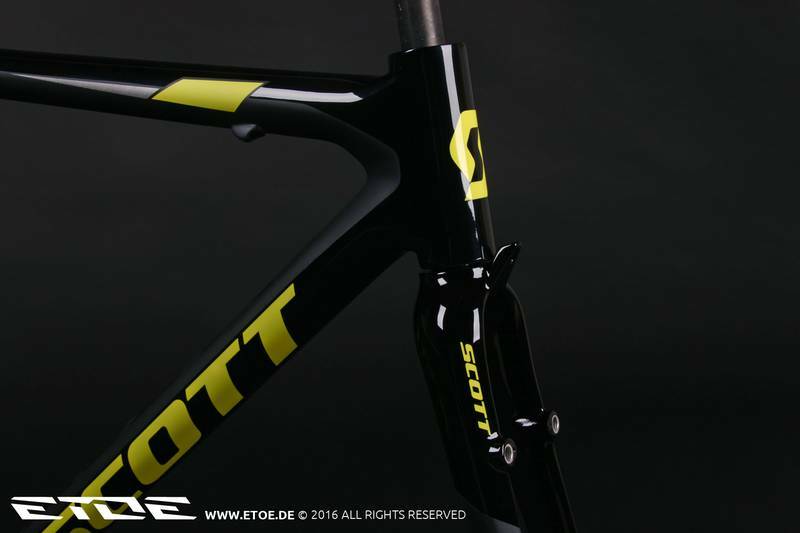 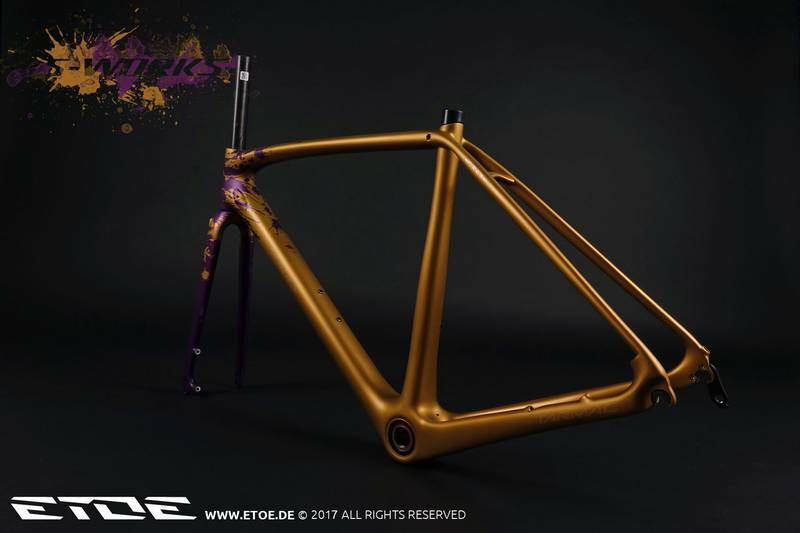 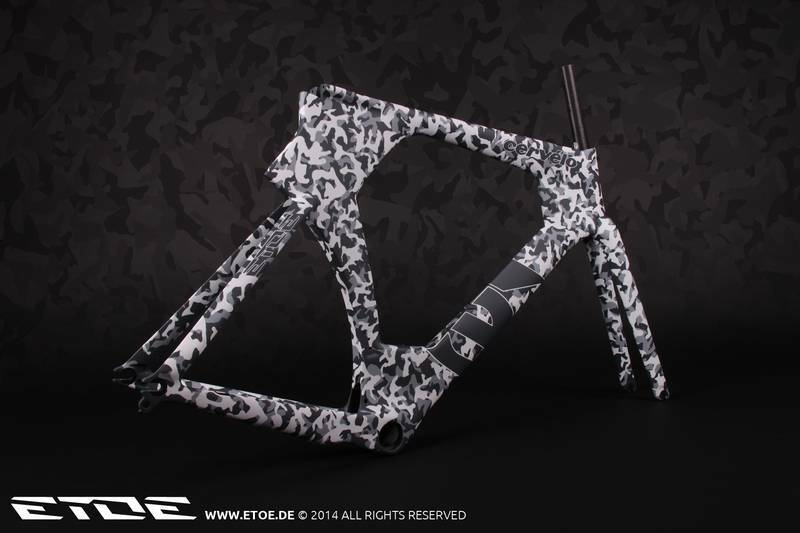 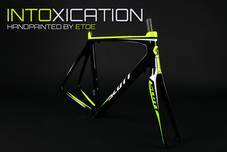 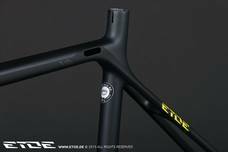 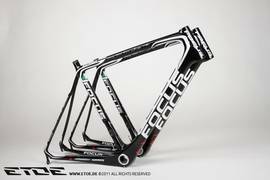 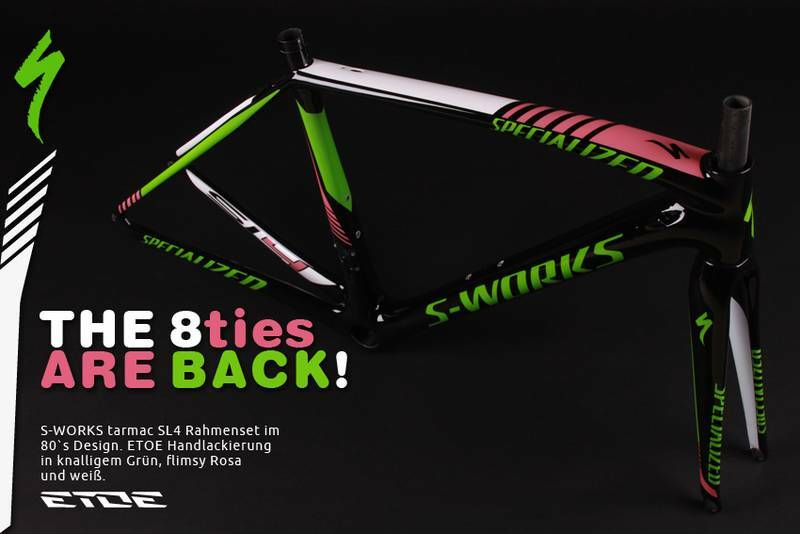 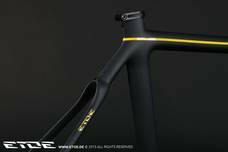 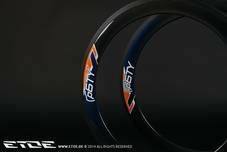 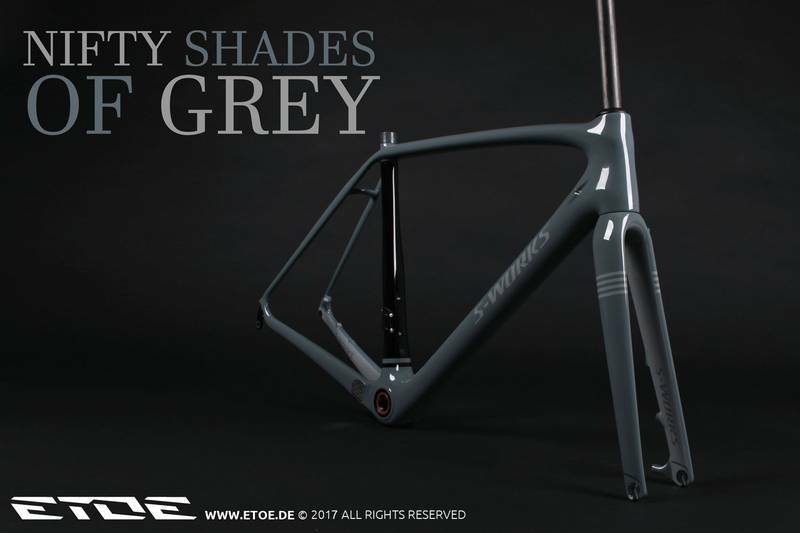 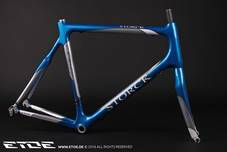 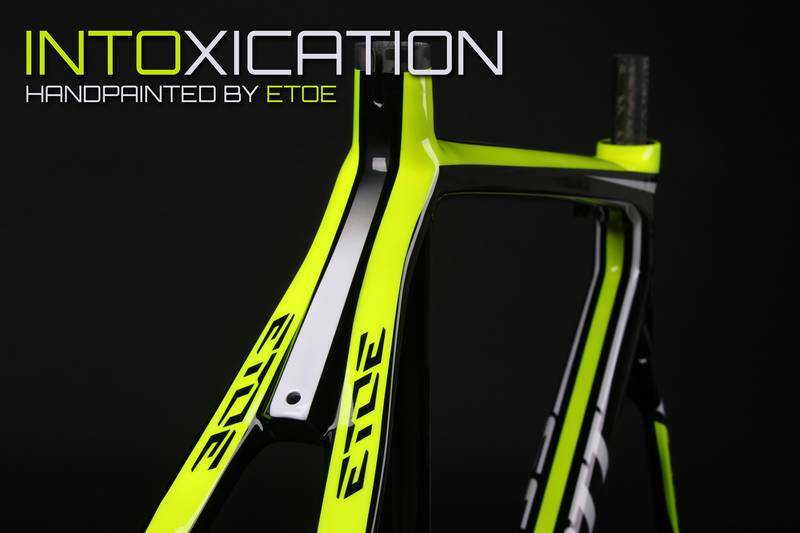 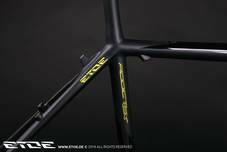 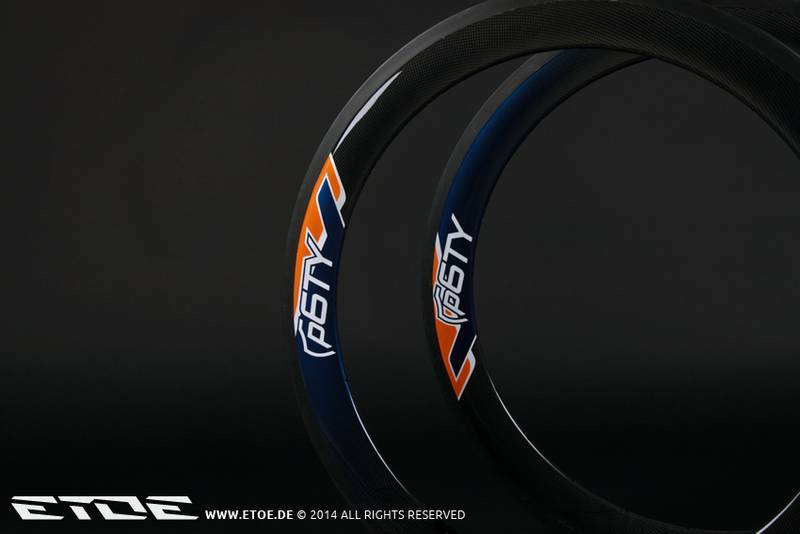 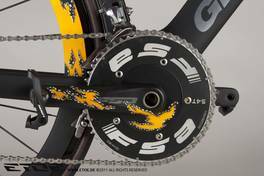 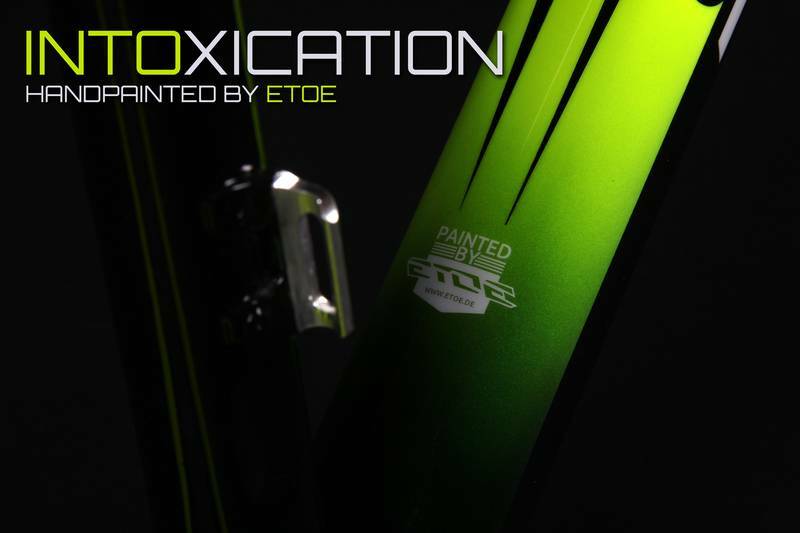 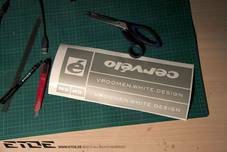 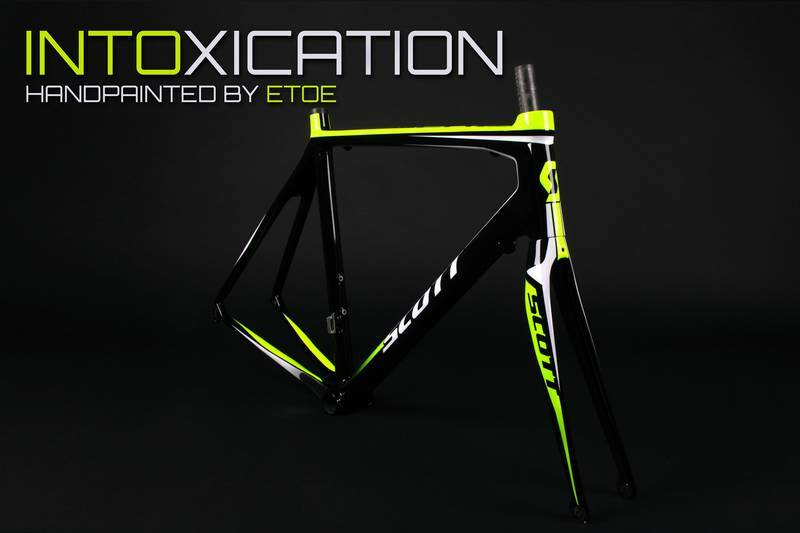 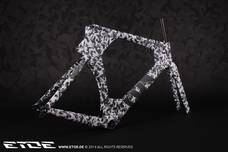 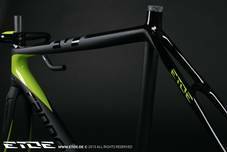 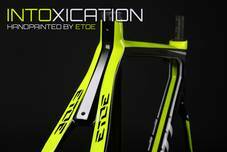 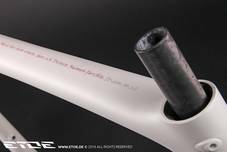 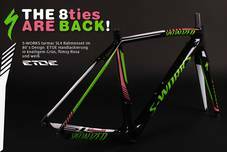 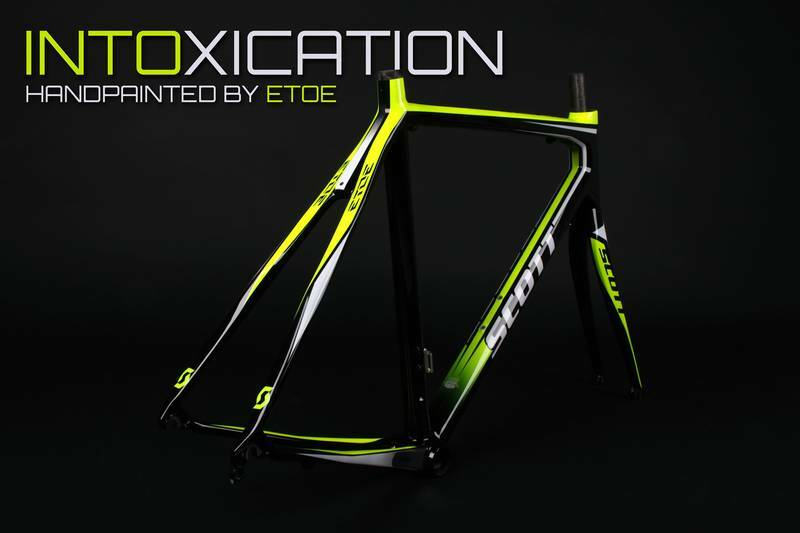 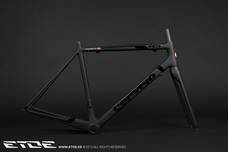 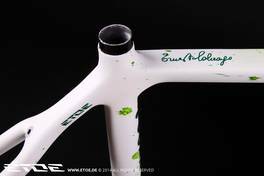 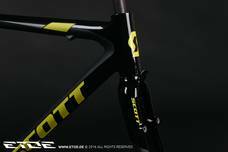 The handmade ETOE Designs are especially light and therefore, they are particulary suitable for premium carbon frame sets. 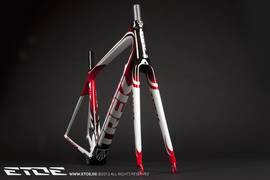 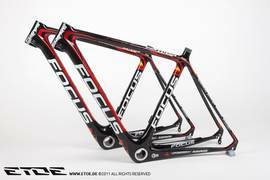 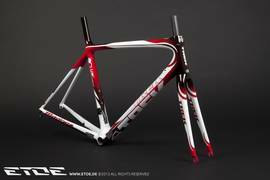 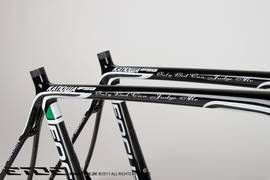 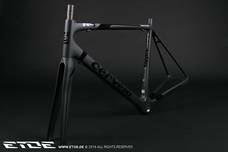 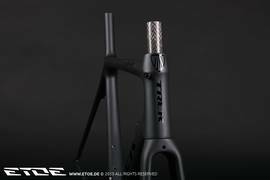 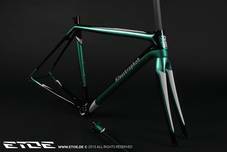 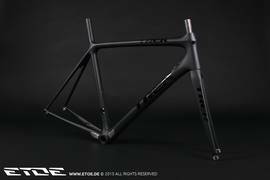 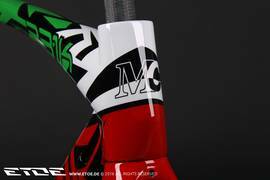 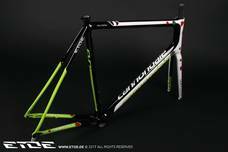 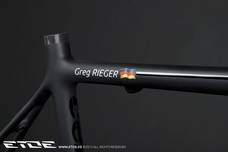 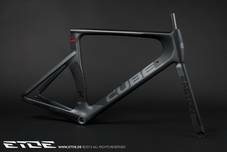 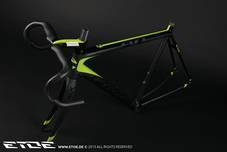 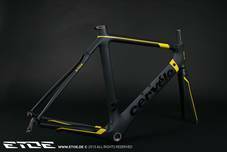 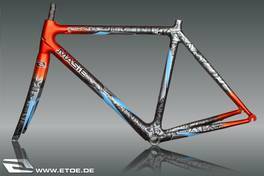 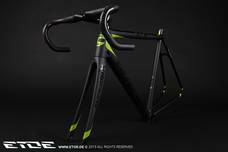 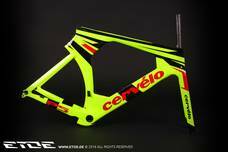 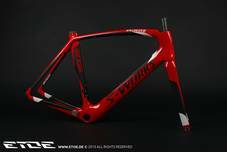 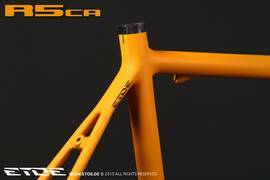 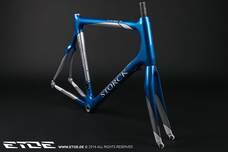 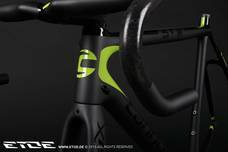 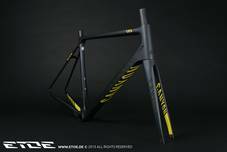 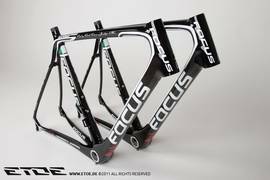 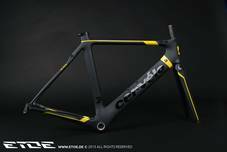 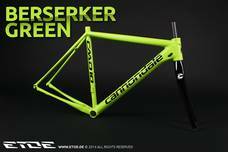 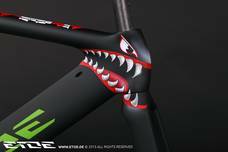 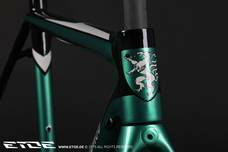 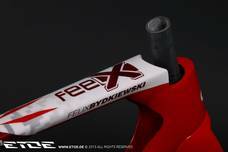 In this video you can see how the designer Martin Jahnecke realises the light paint on a carbon frame set. Carbon paints job are handmade at ETOE. 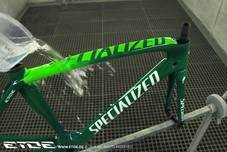 This video shows the work of 3 days in just a few minutes. 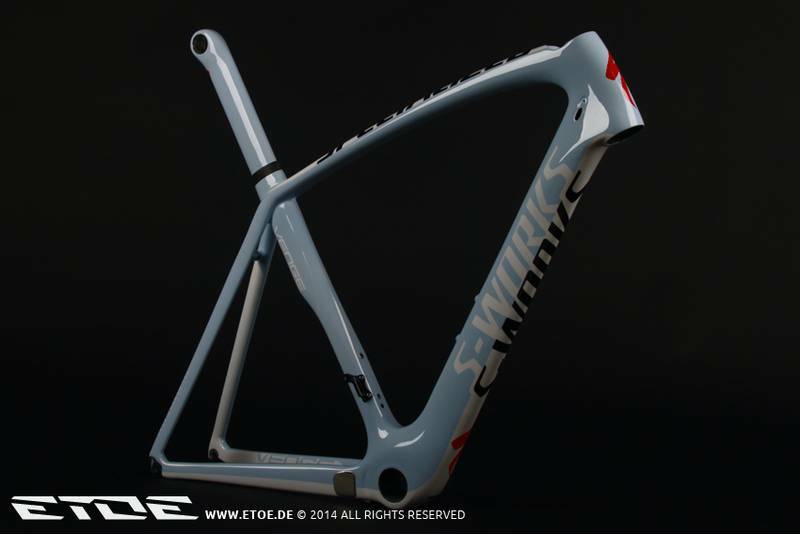 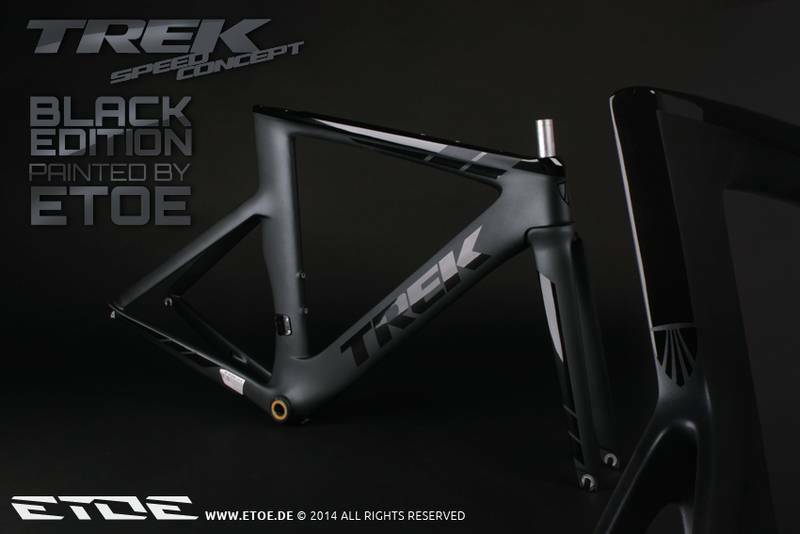 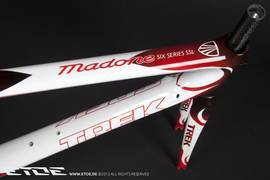 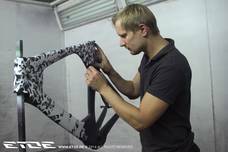 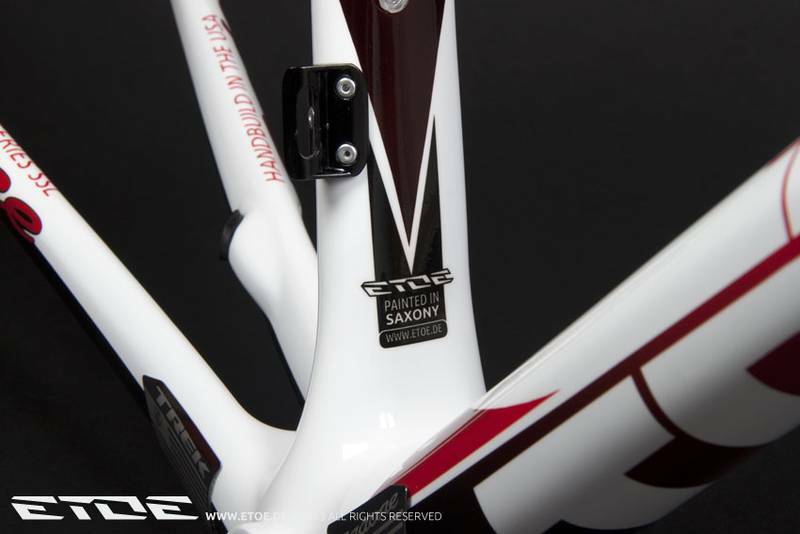 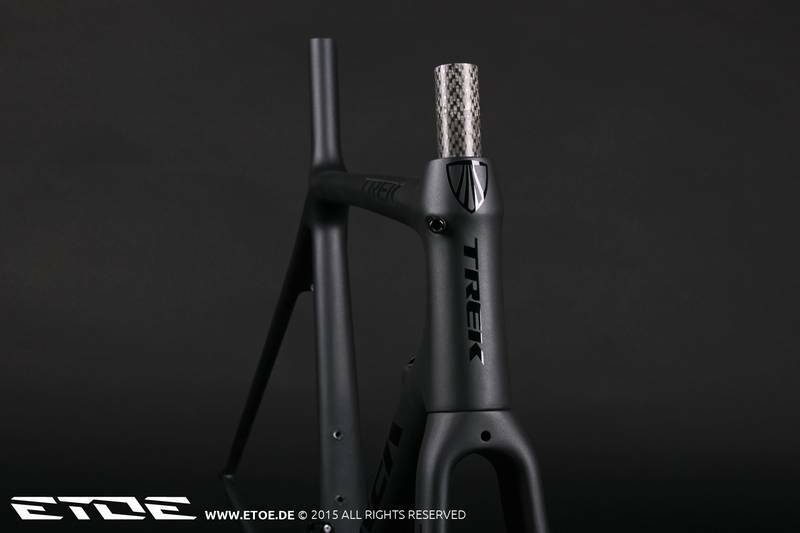 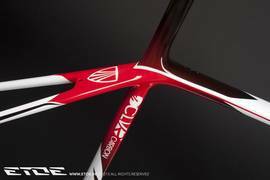 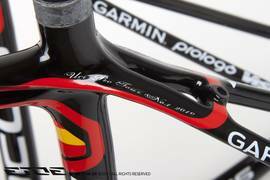 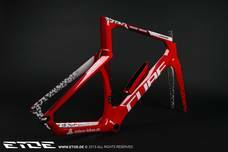 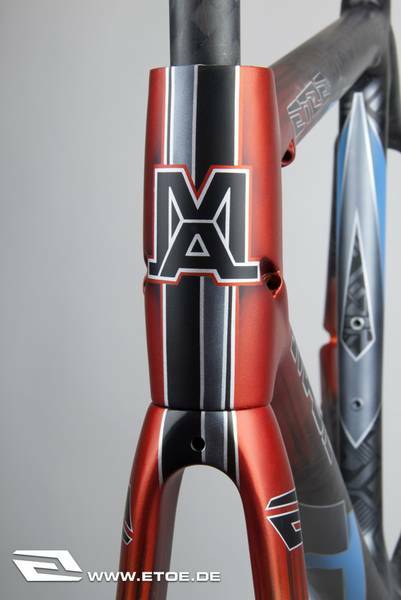 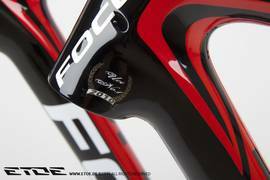 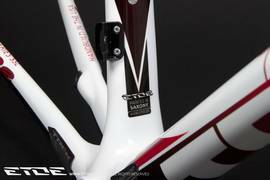 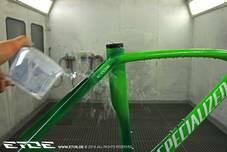 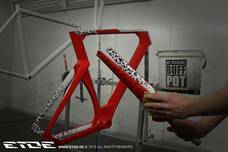 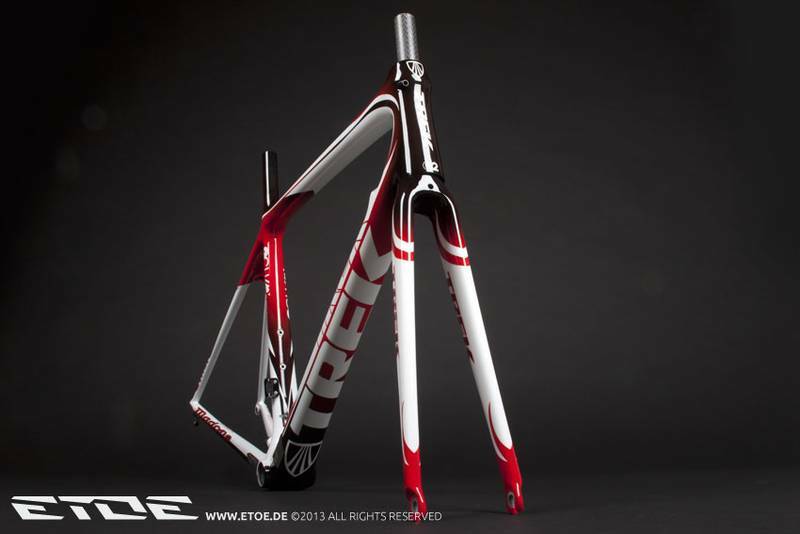 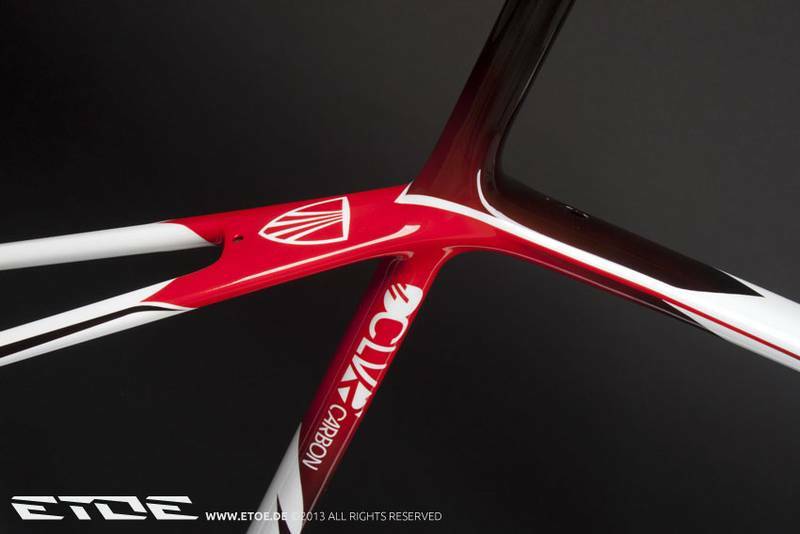 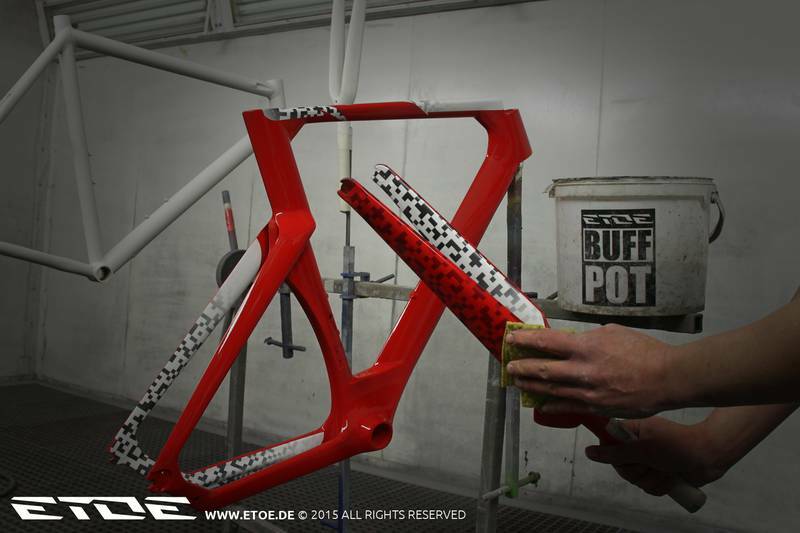 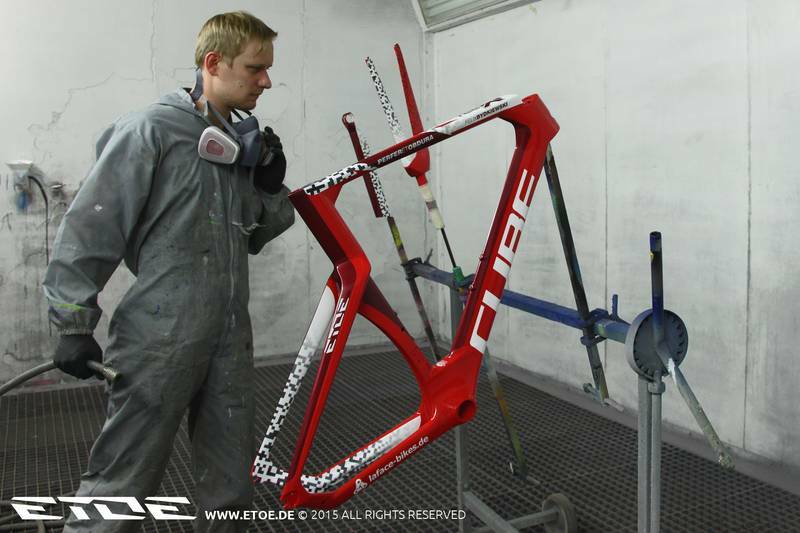 How the Trek Madone emerges: from preparation to primer to spraying on the design. 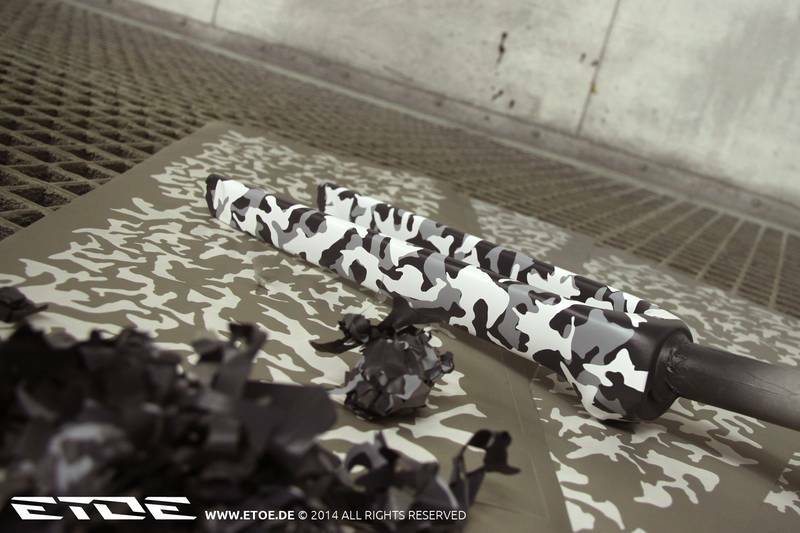 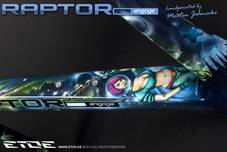 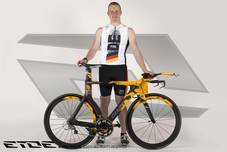 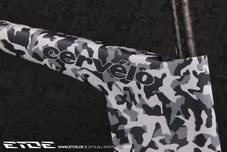 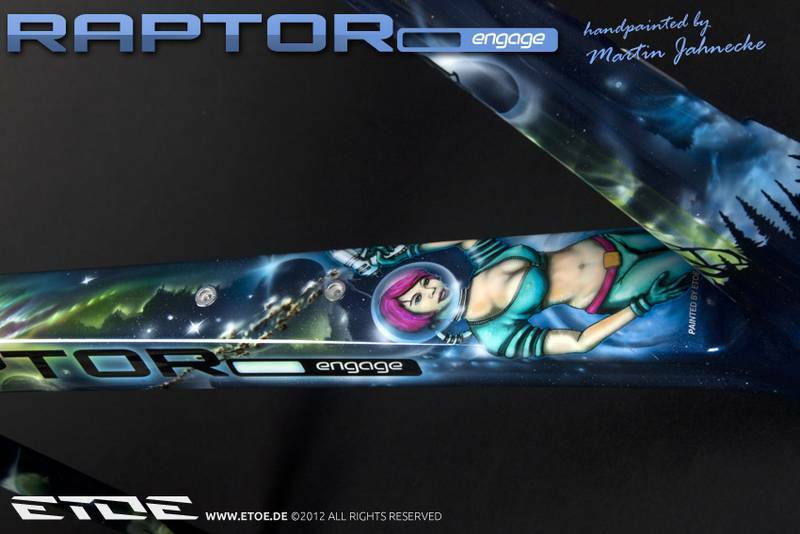 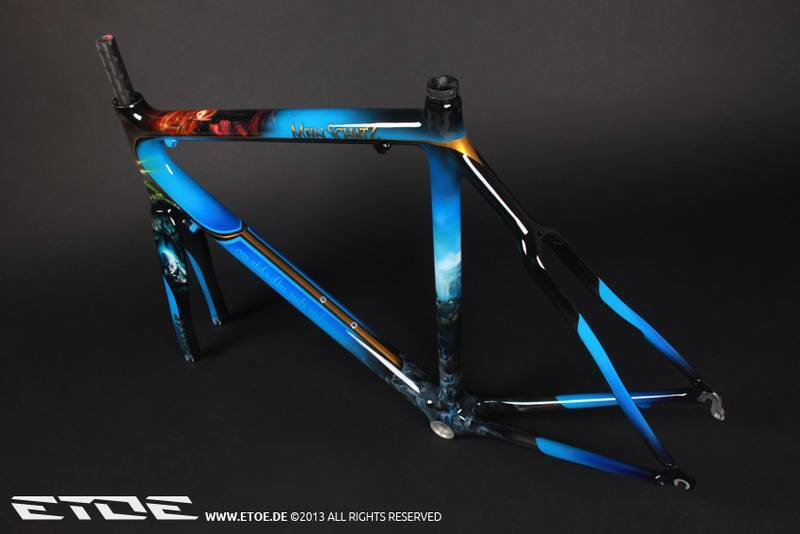 The comples designs with average and detailed graphics are handmade by Martin Jahnecke. 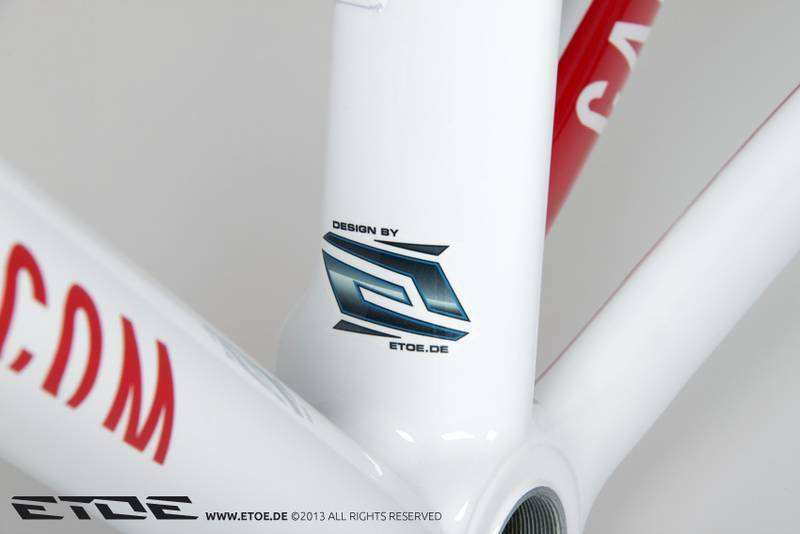 Every design is one of a kind. The work usually takes up to 10 days and more. 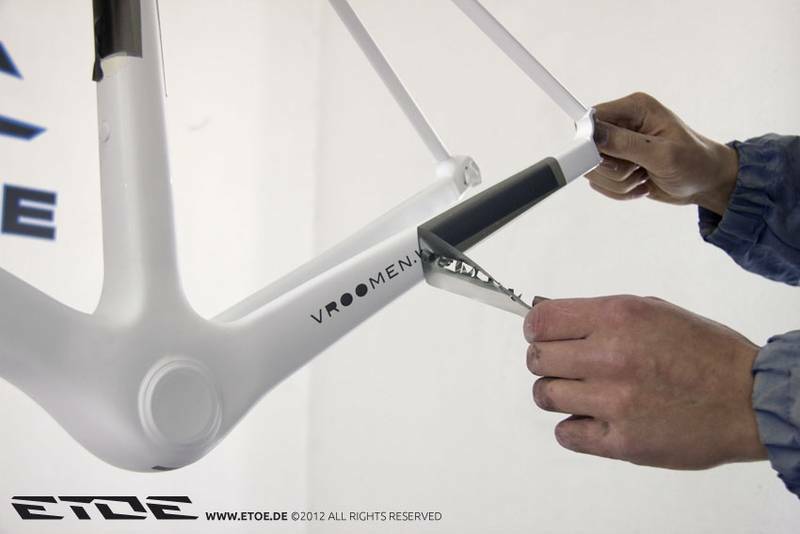 First the design is prefabricated on paper and later painted by hand on the frame set. 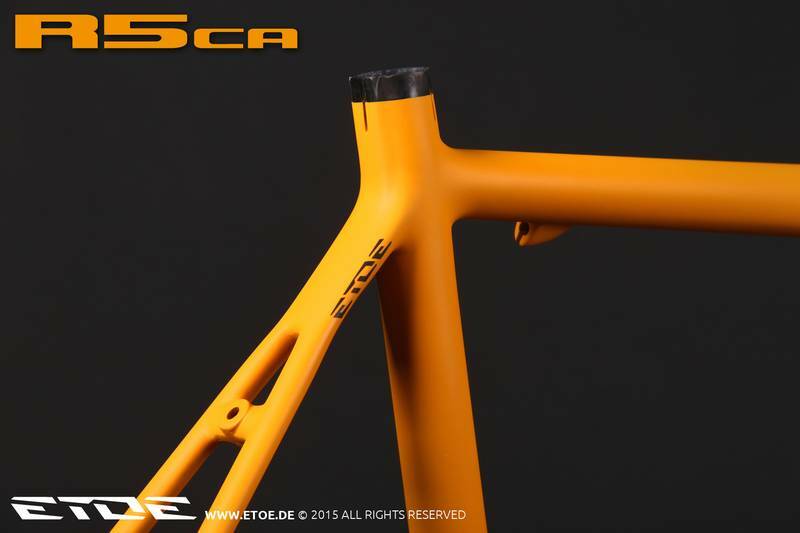 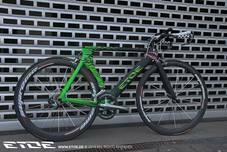 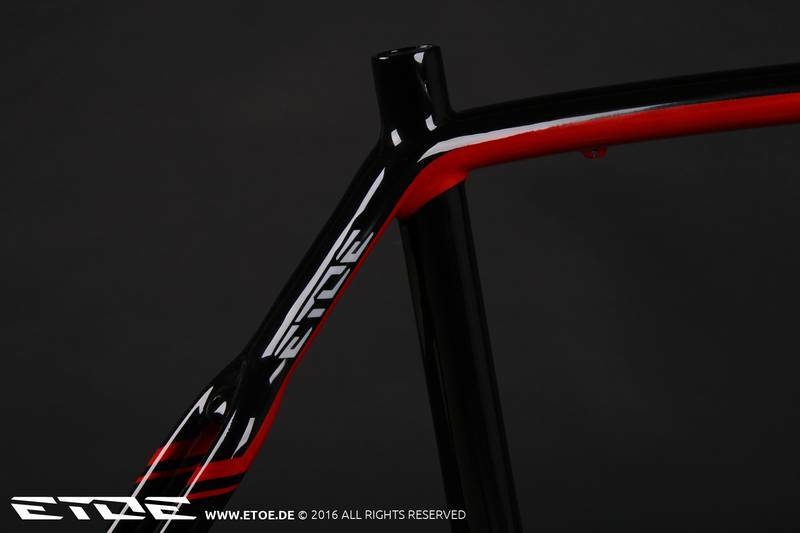 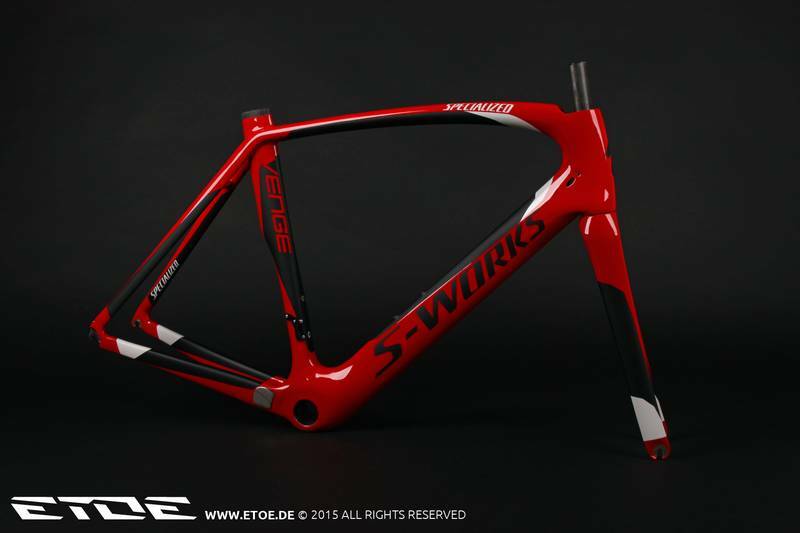 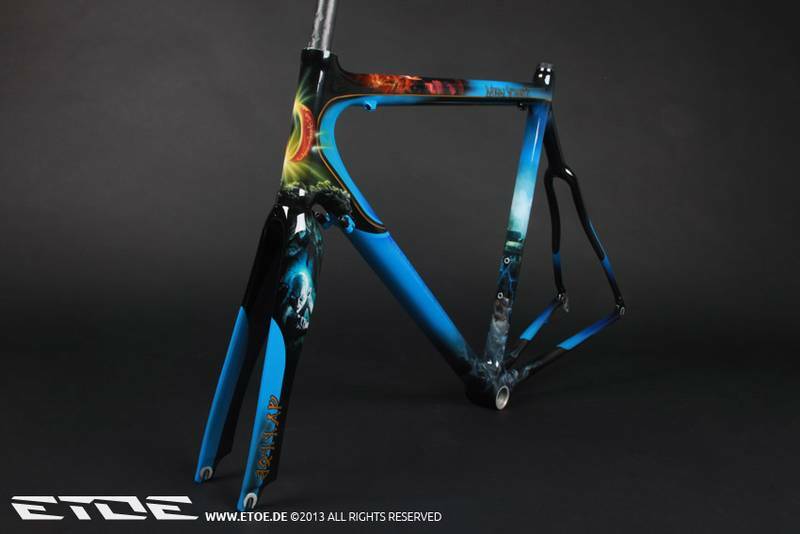 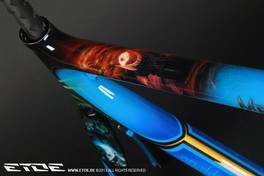 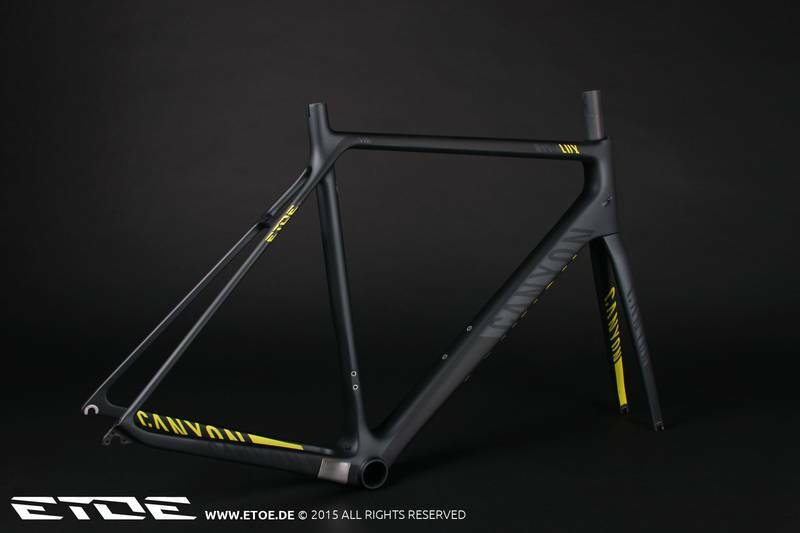 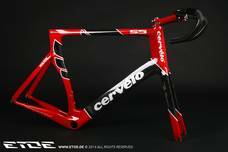 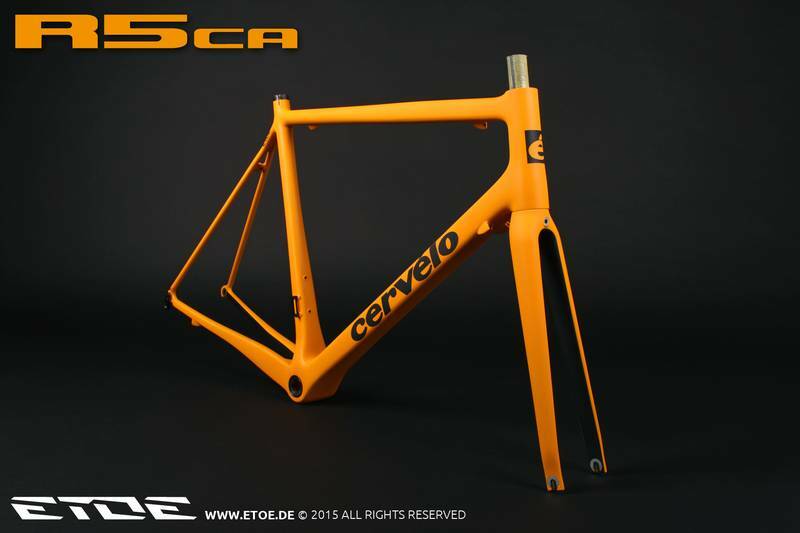 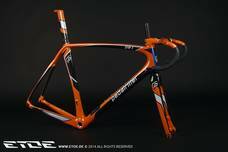 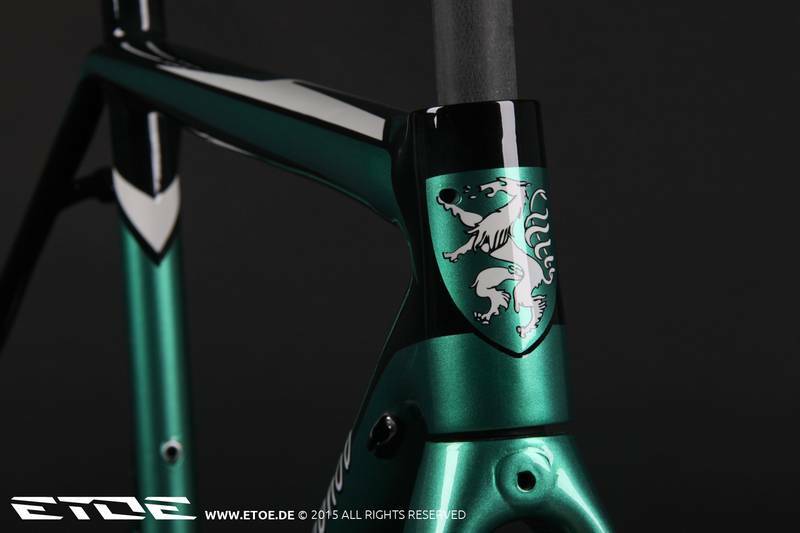 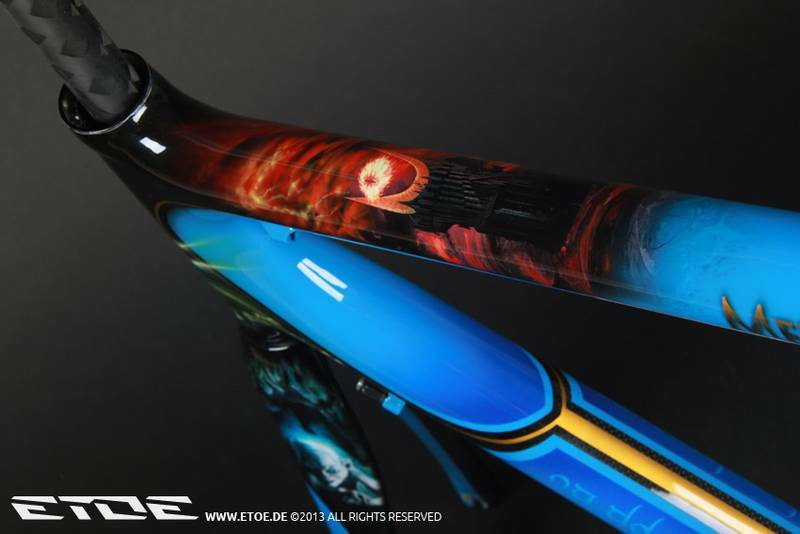 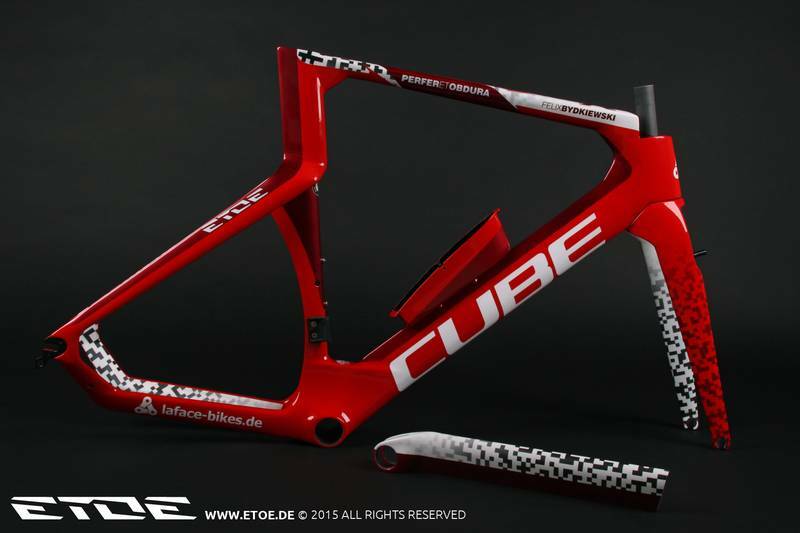 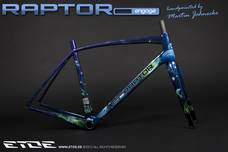 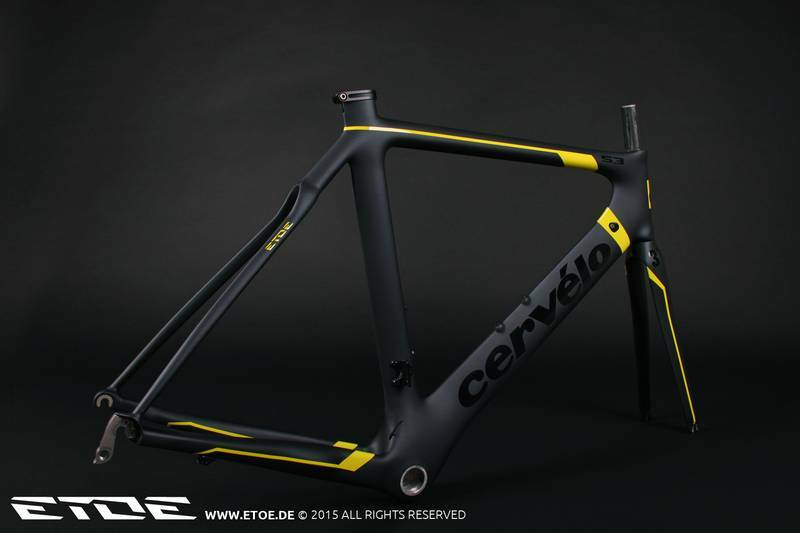 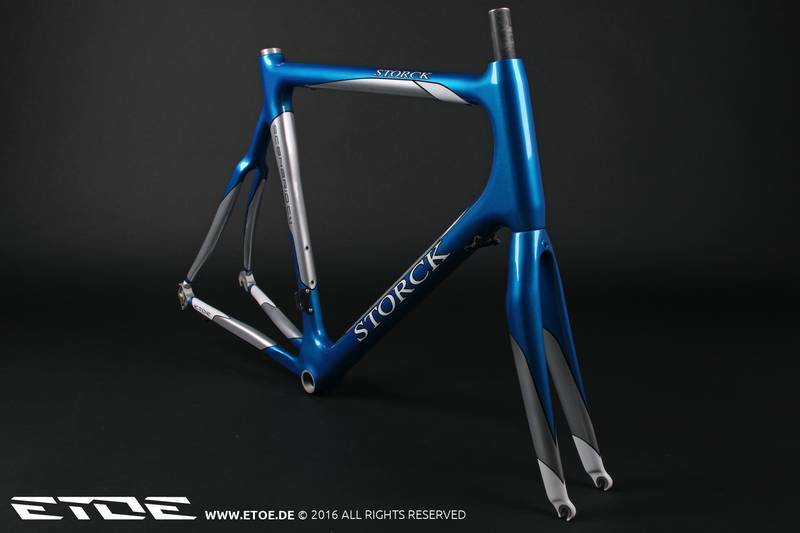 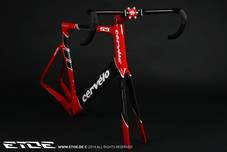 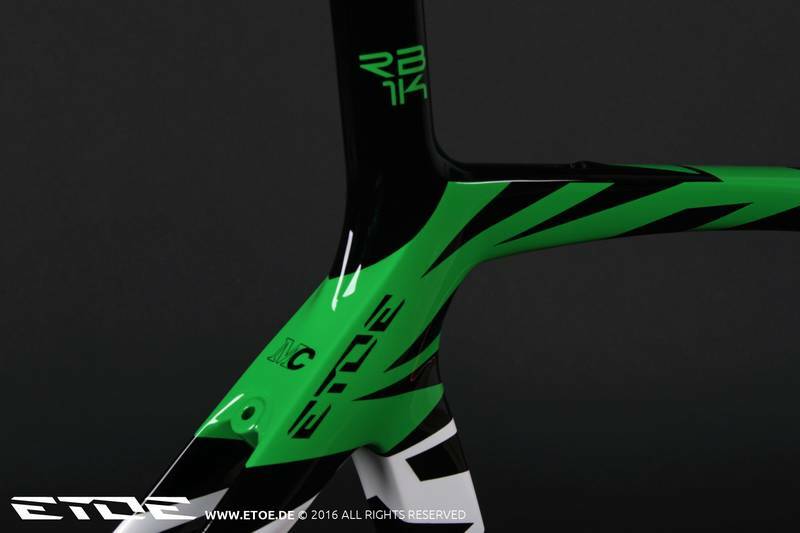 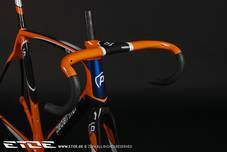 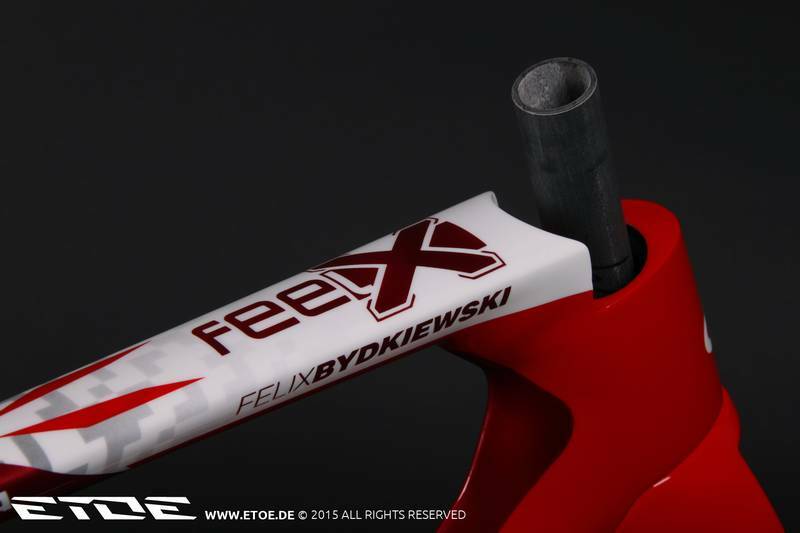 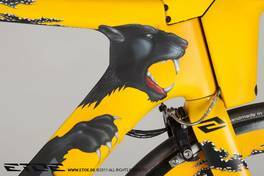 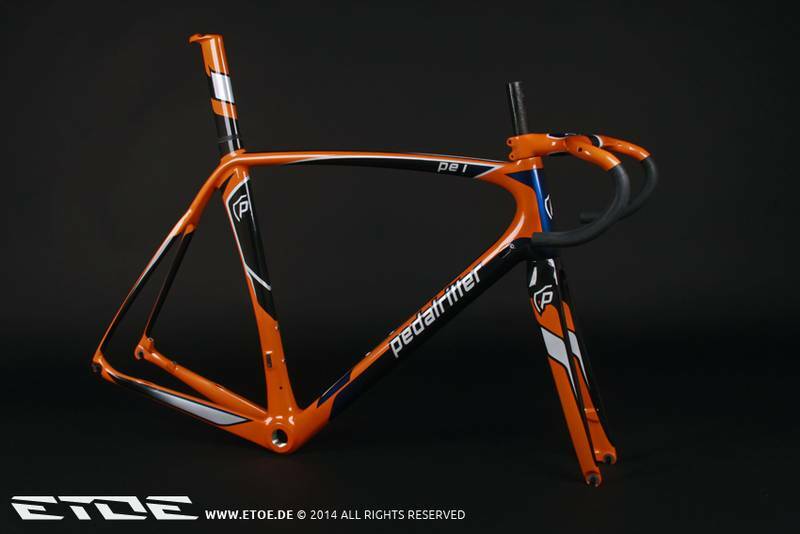 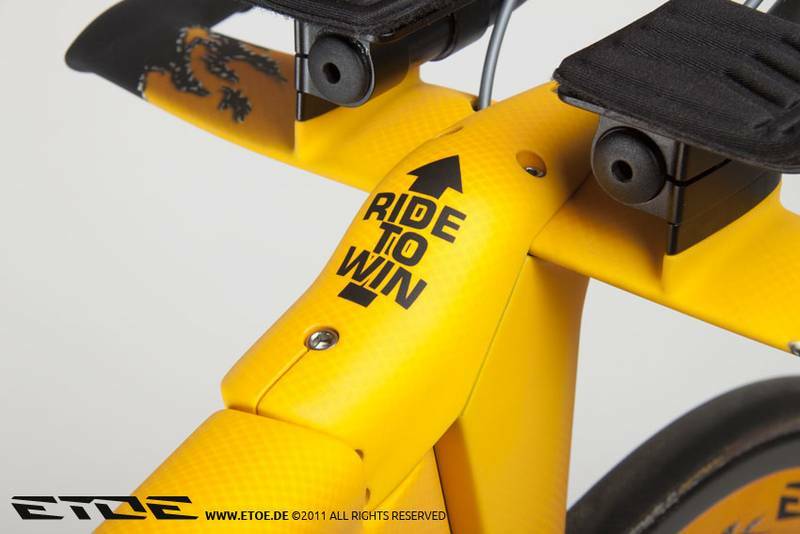 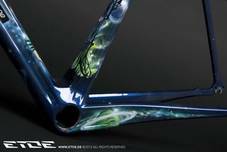 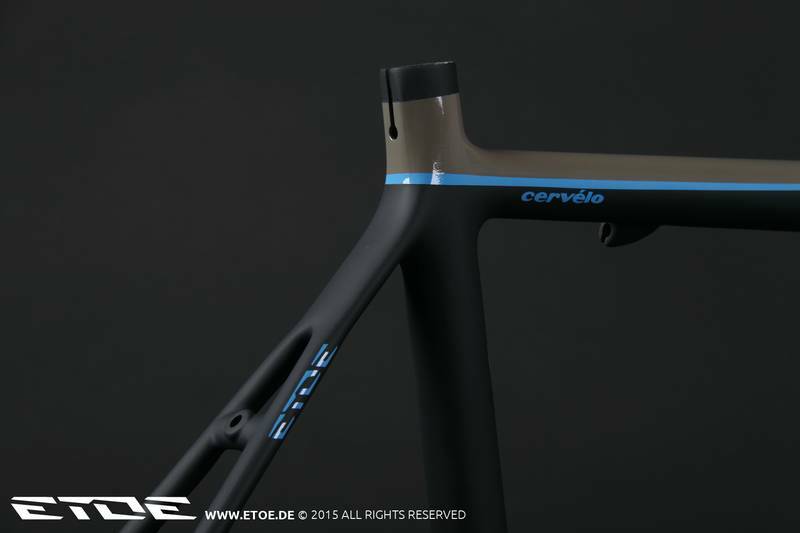 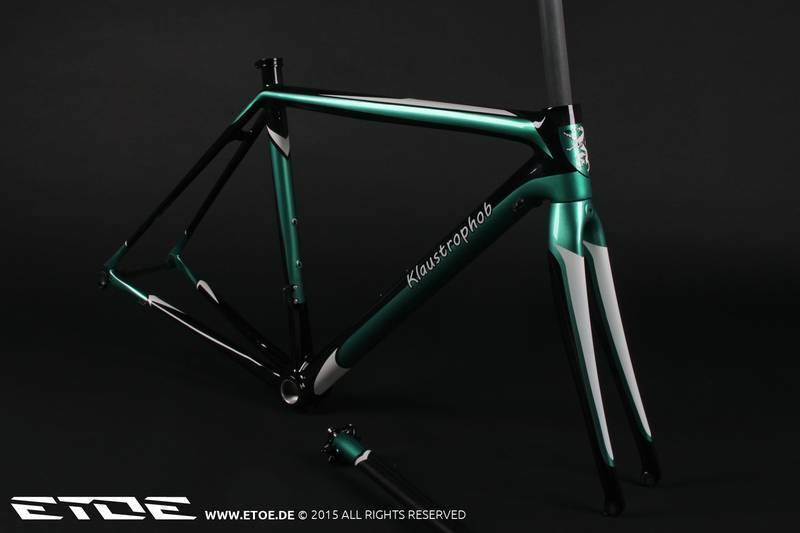 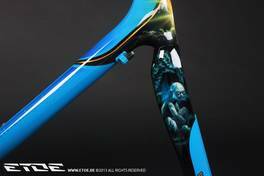 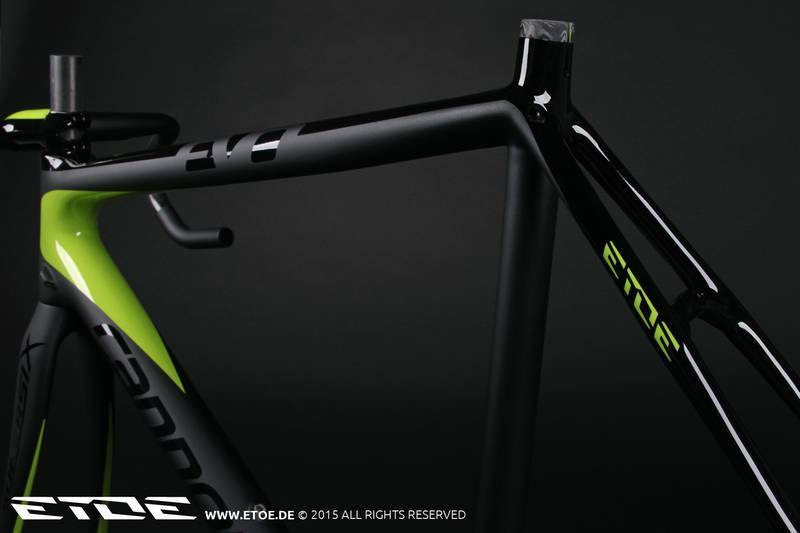 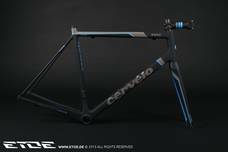 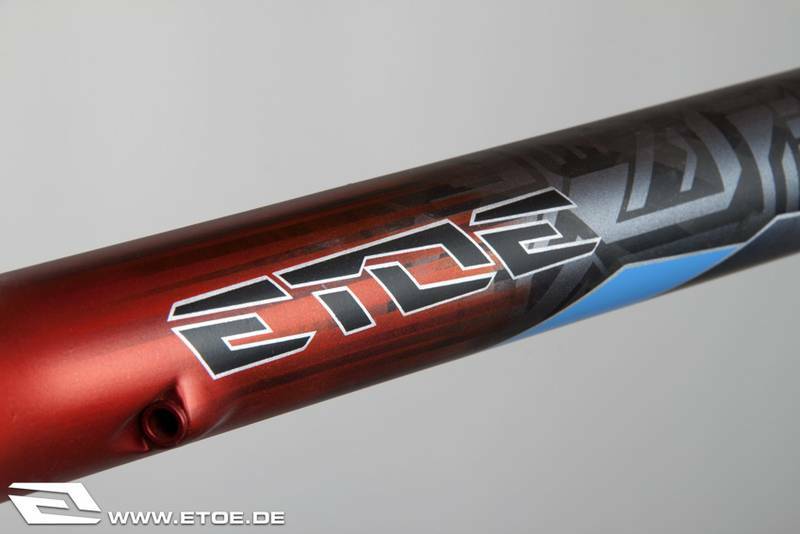 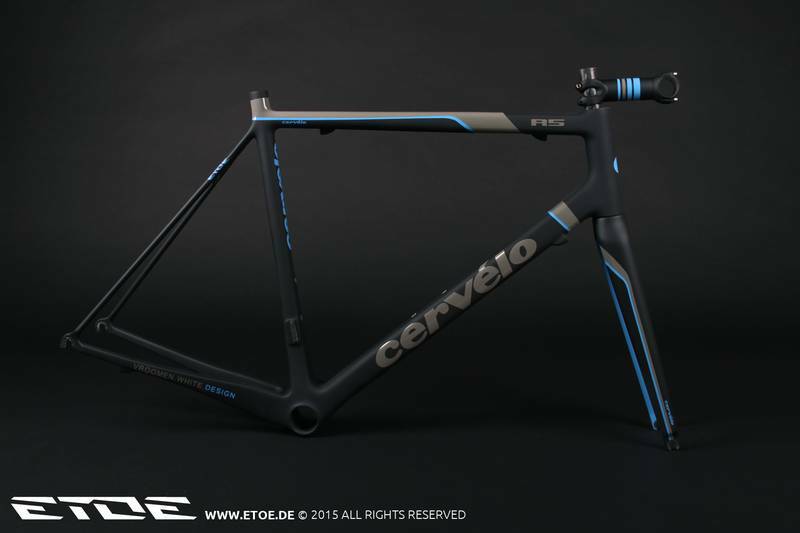 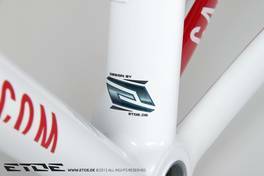 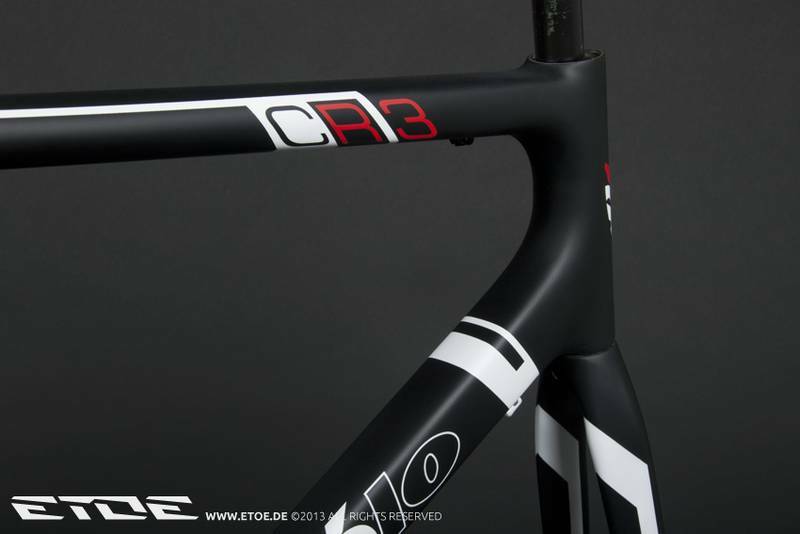 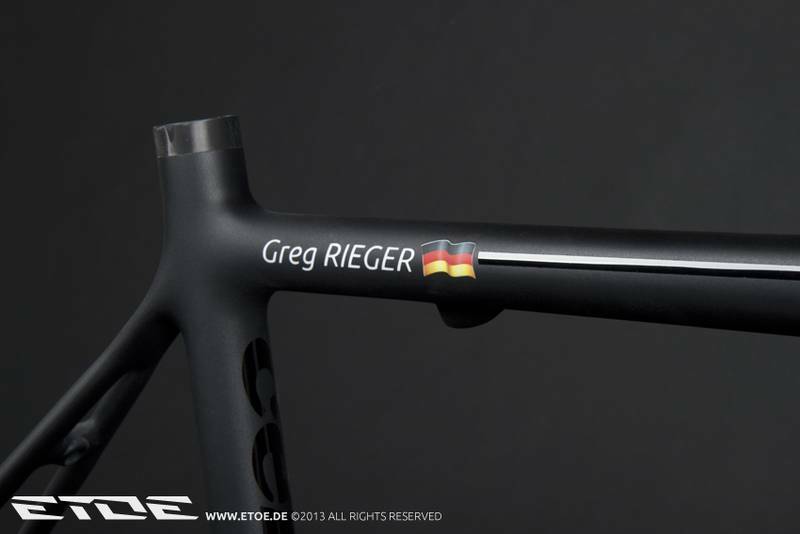 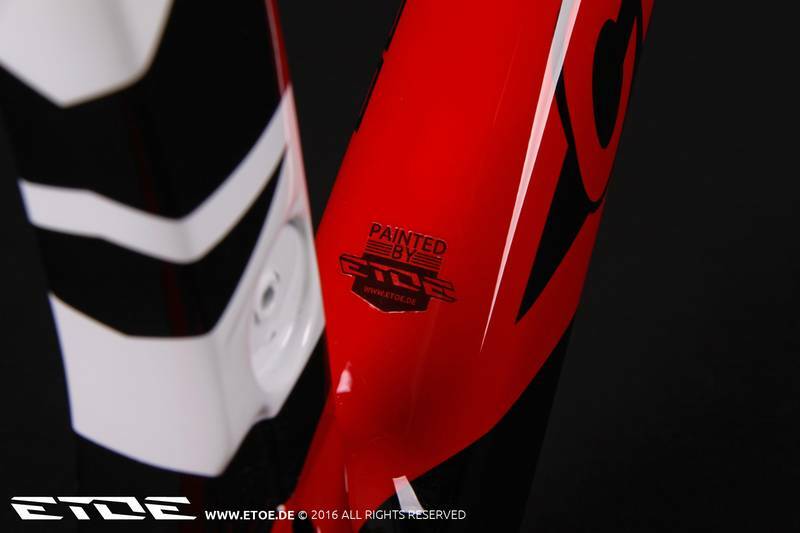 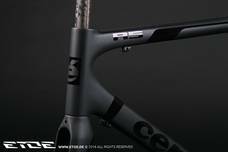 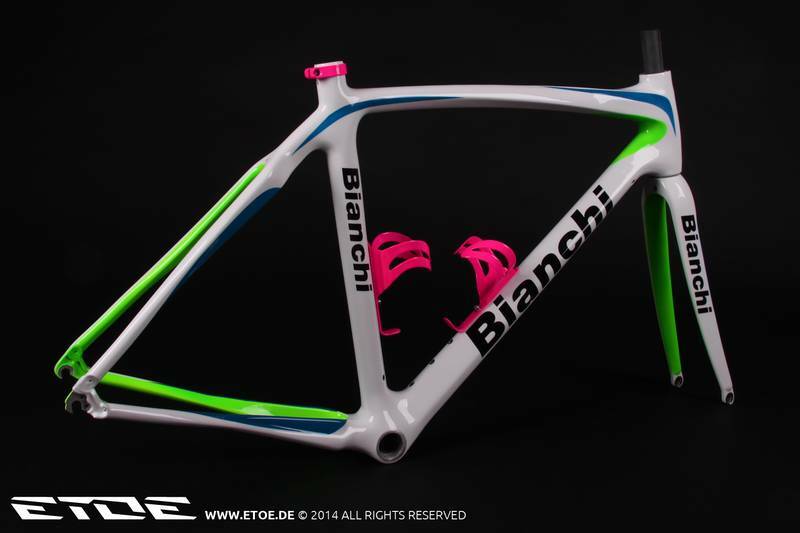 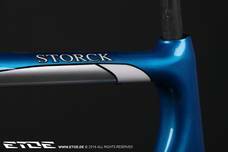 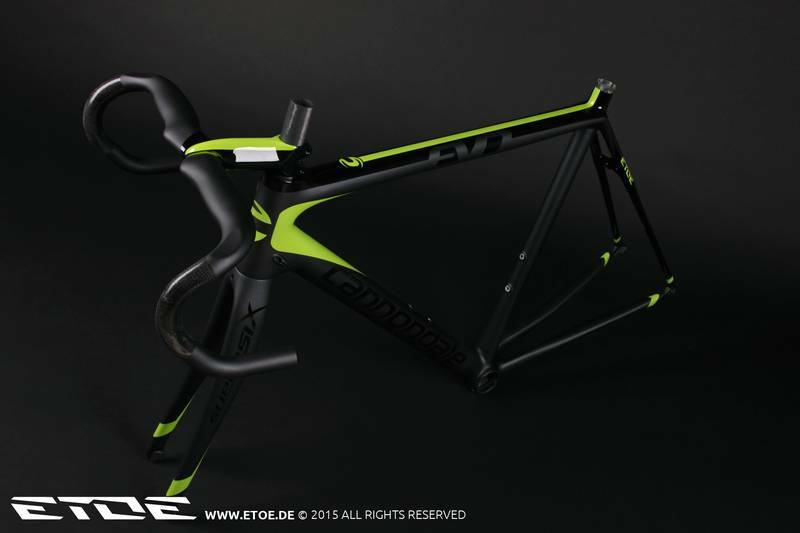 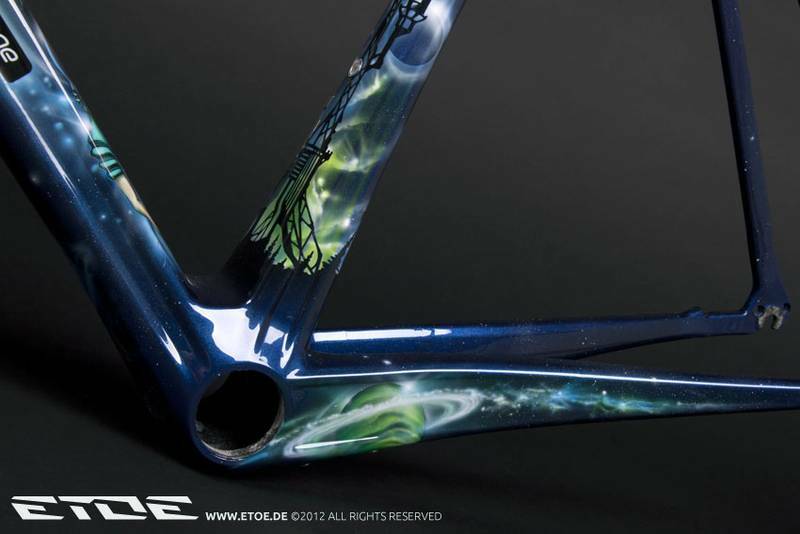 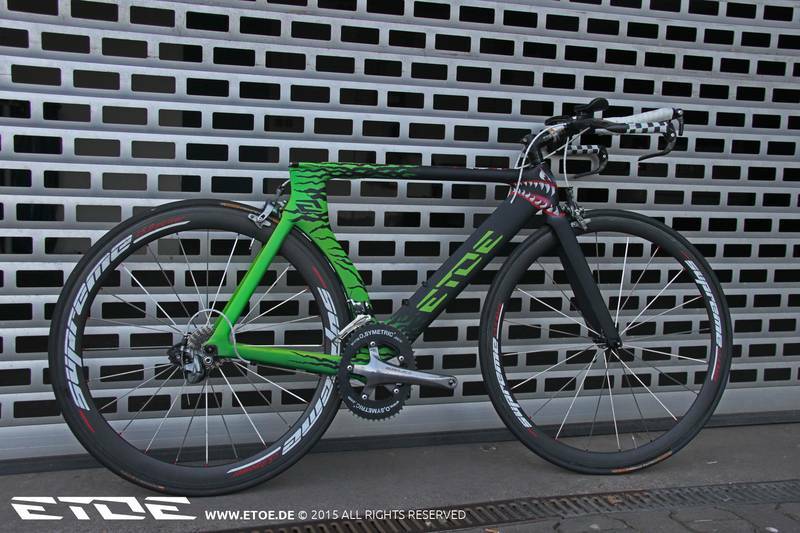 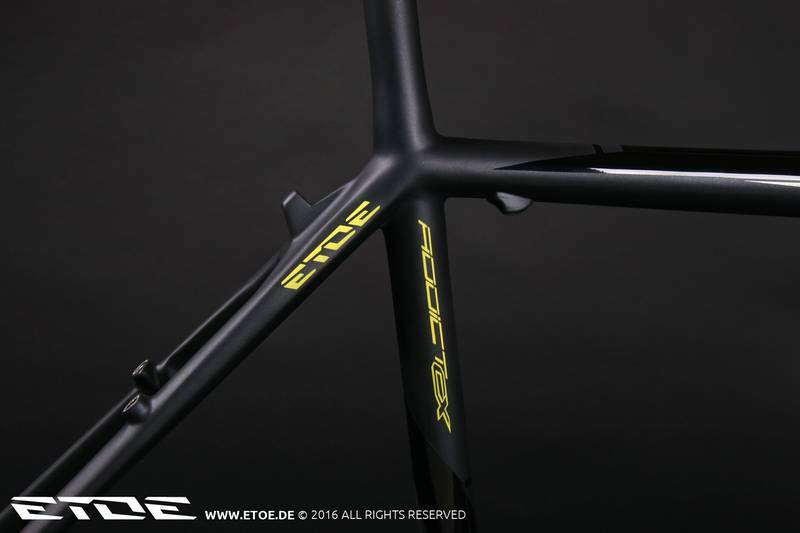 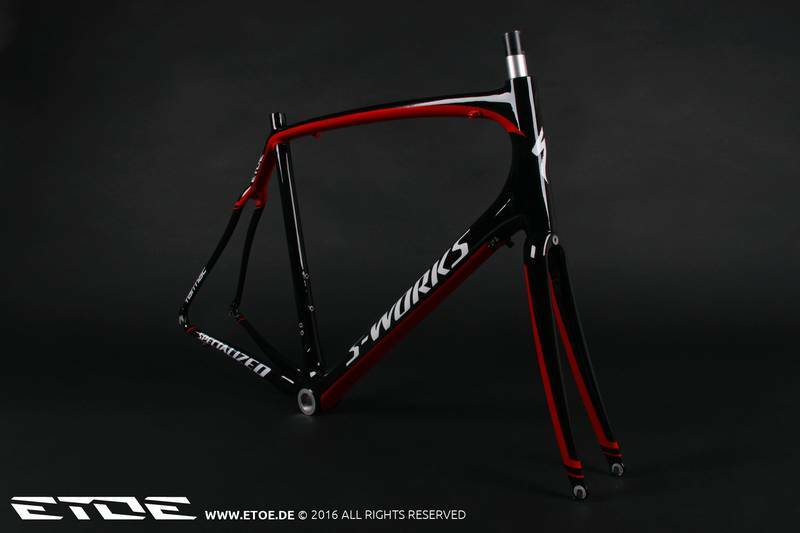 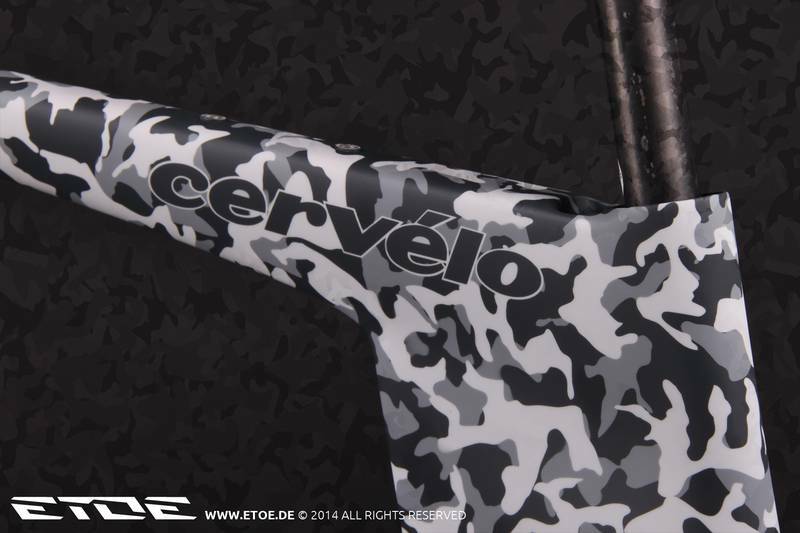 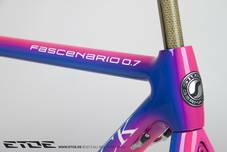 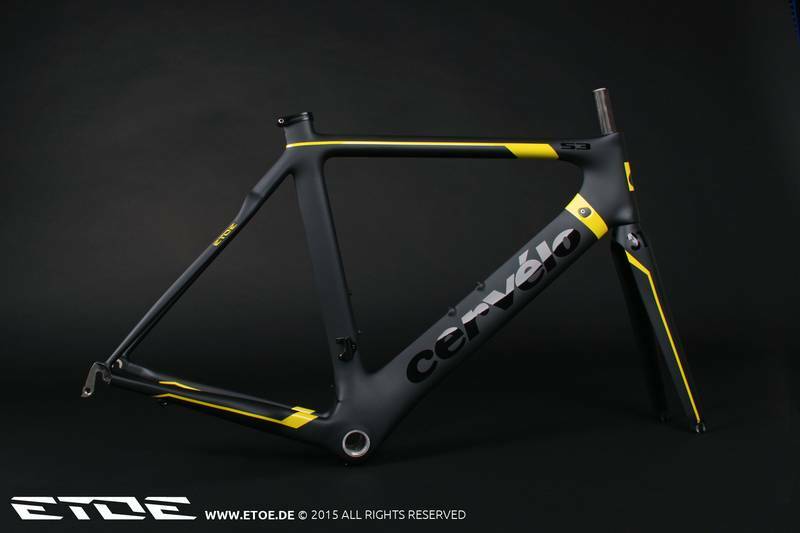 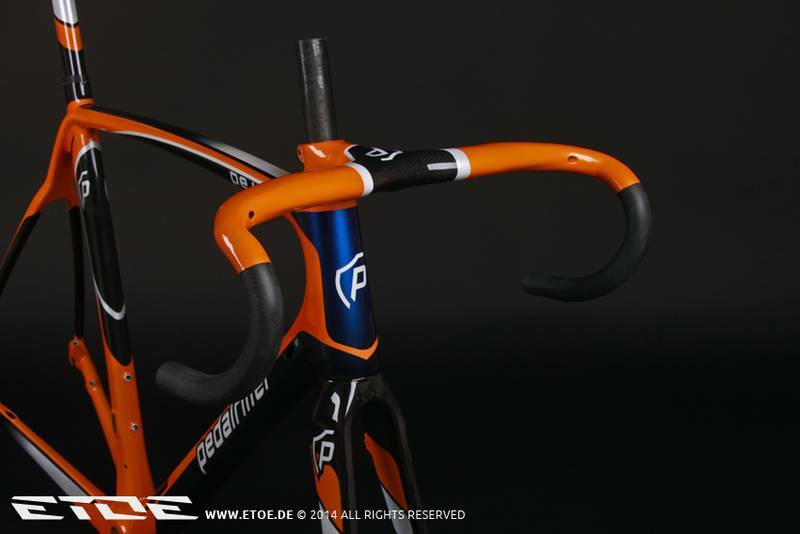 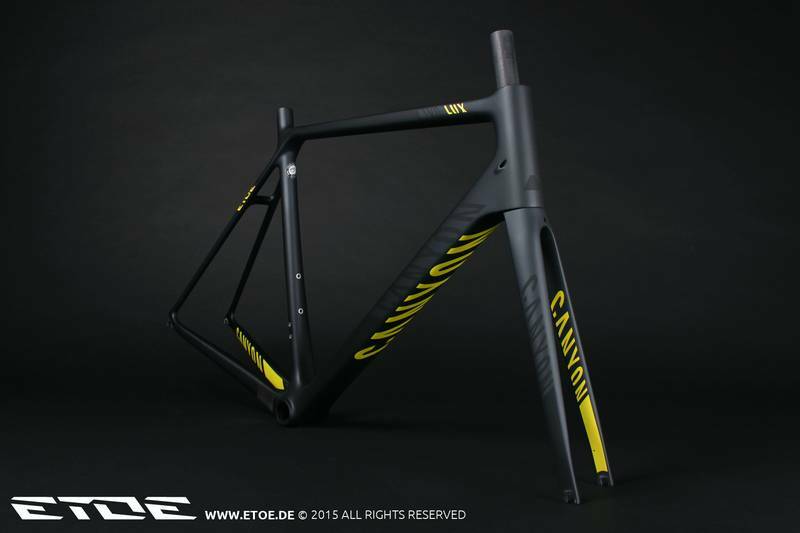 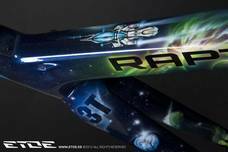 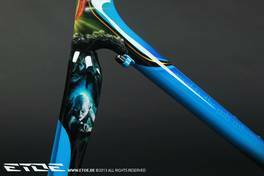 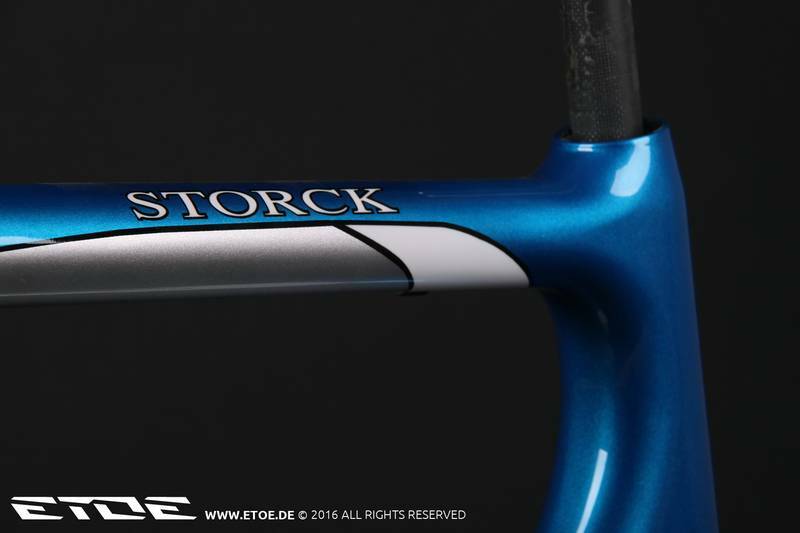 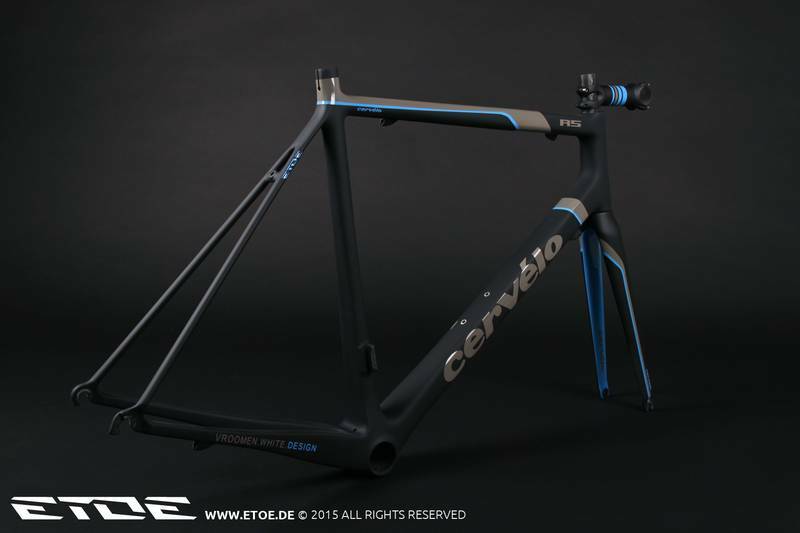 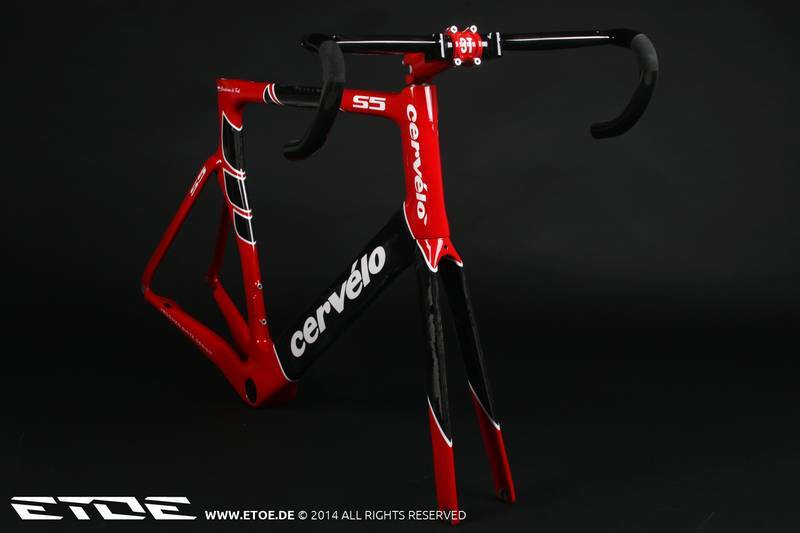 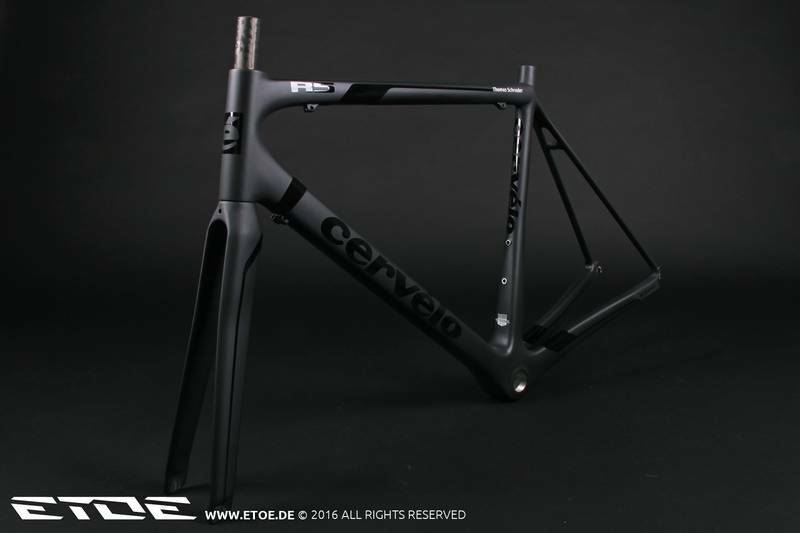 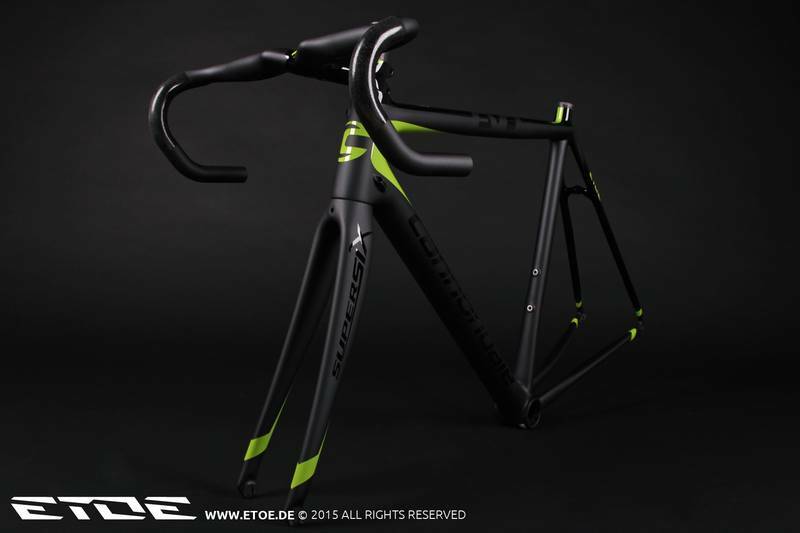 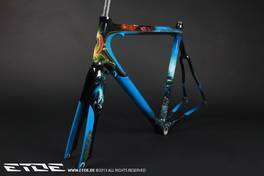 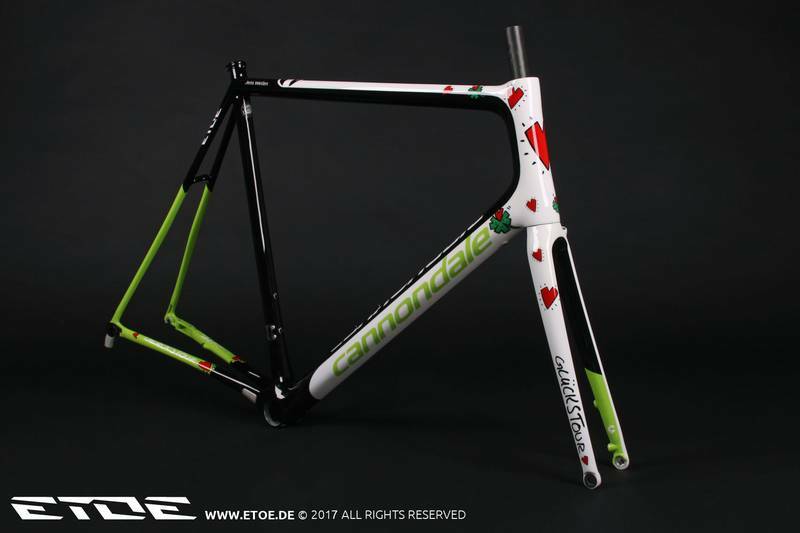 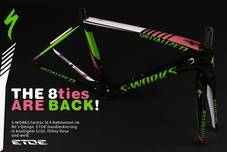 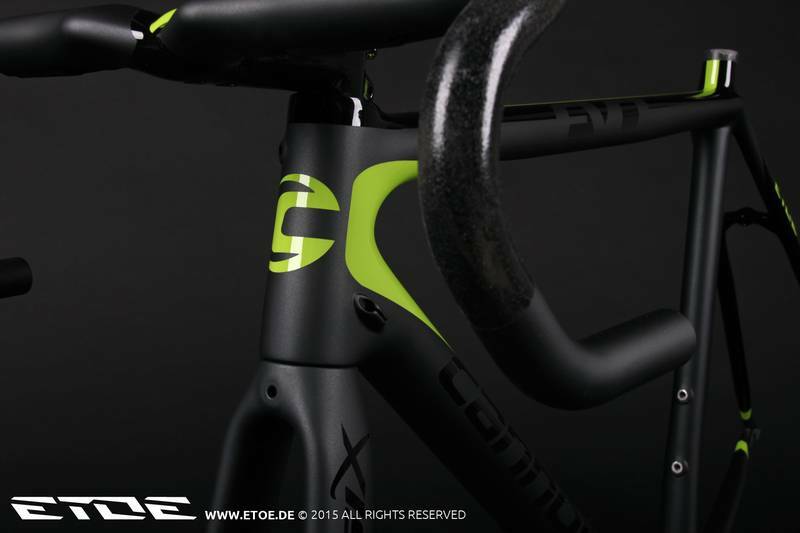 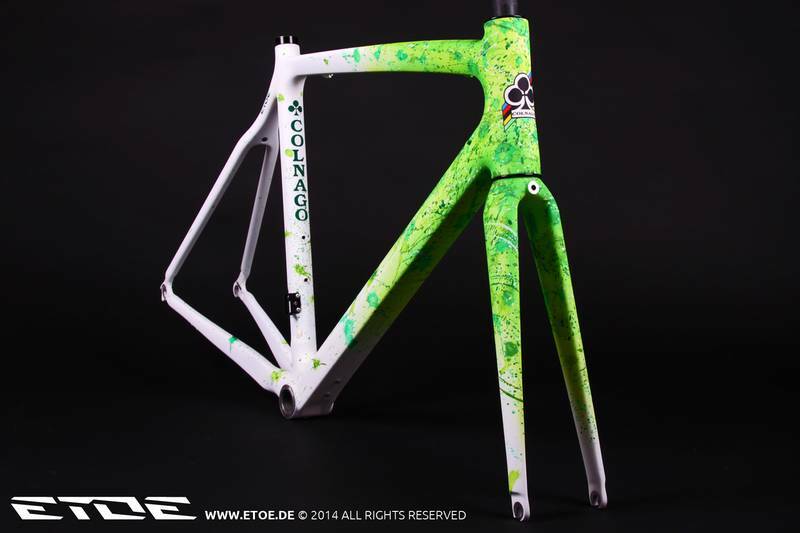 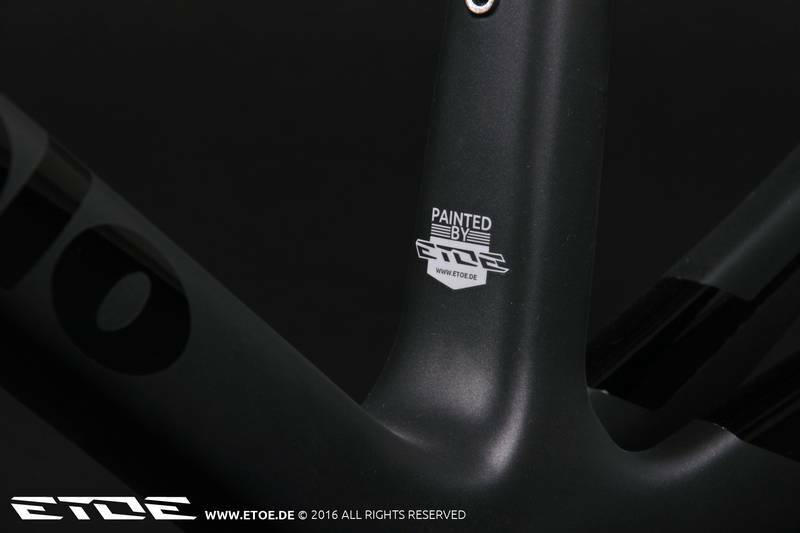 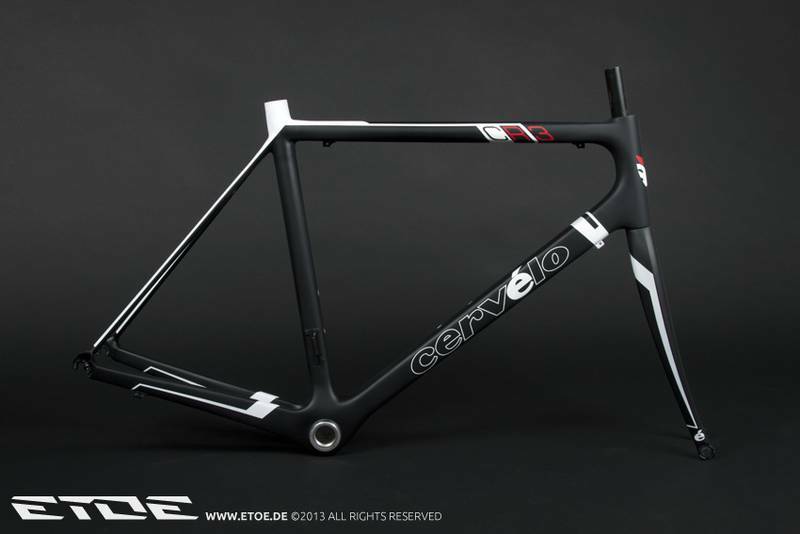 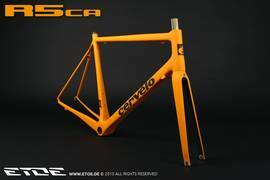 The Cervélo P5 frame made of carbon fibre got a special design with vibrant colors in the ETOE paintshop. 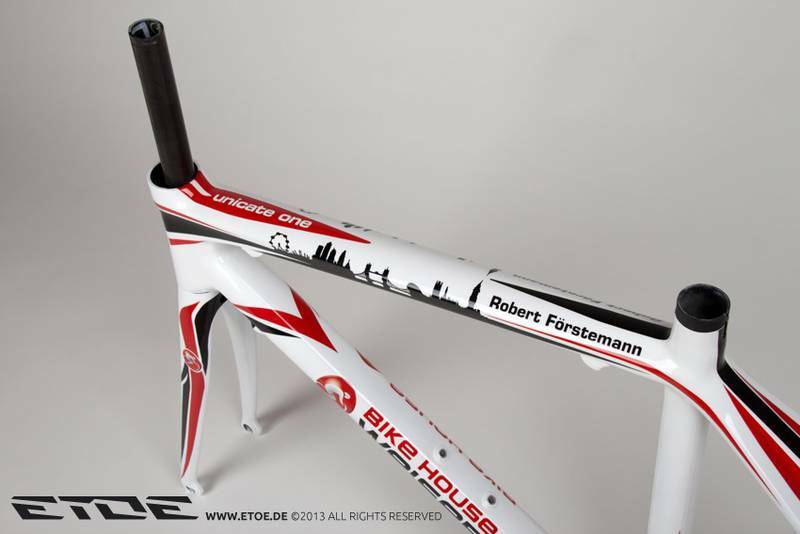 The design was created by Martin Jahnecke. 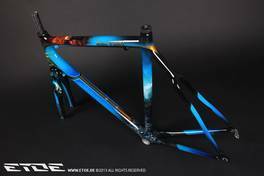 He also painted the frames by hand. 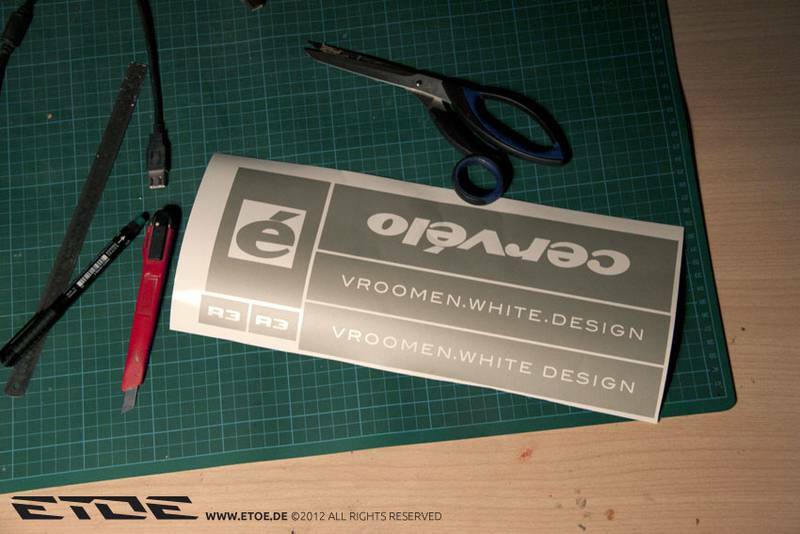 The design is also available in black and grey matt/glossy combination. 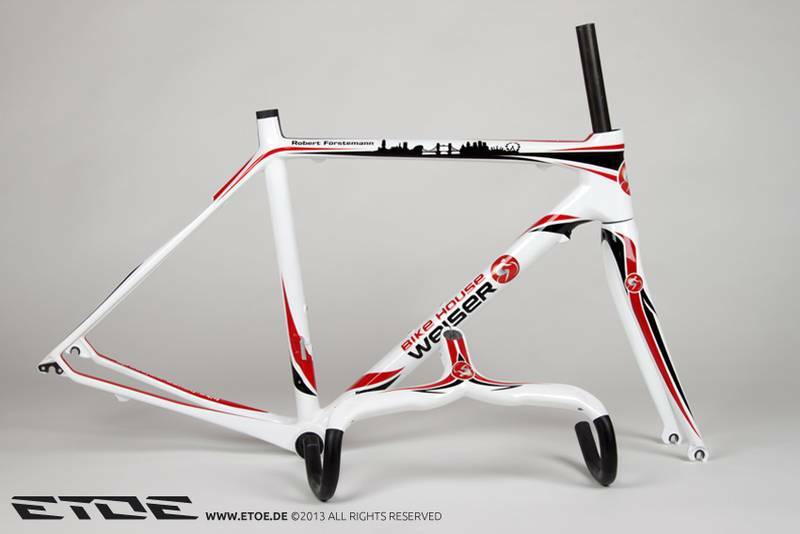 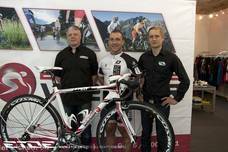 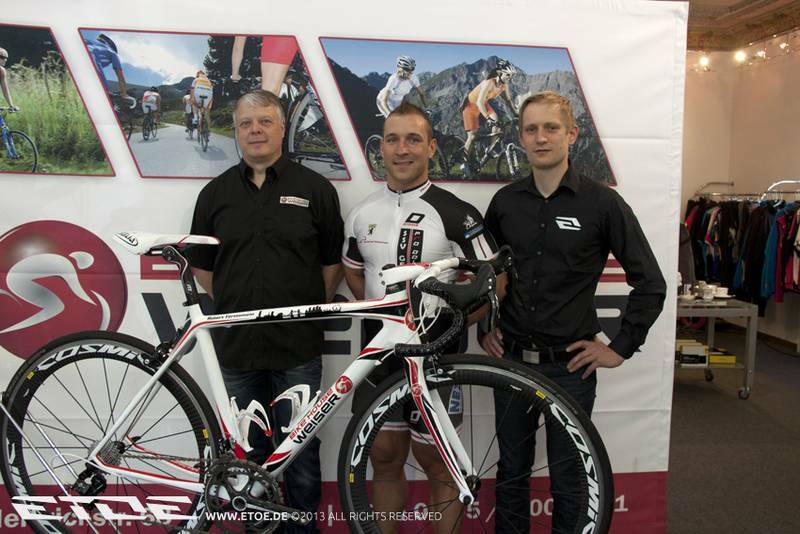 95 per cent of our German clients order a classic color scheme using black, white and red. 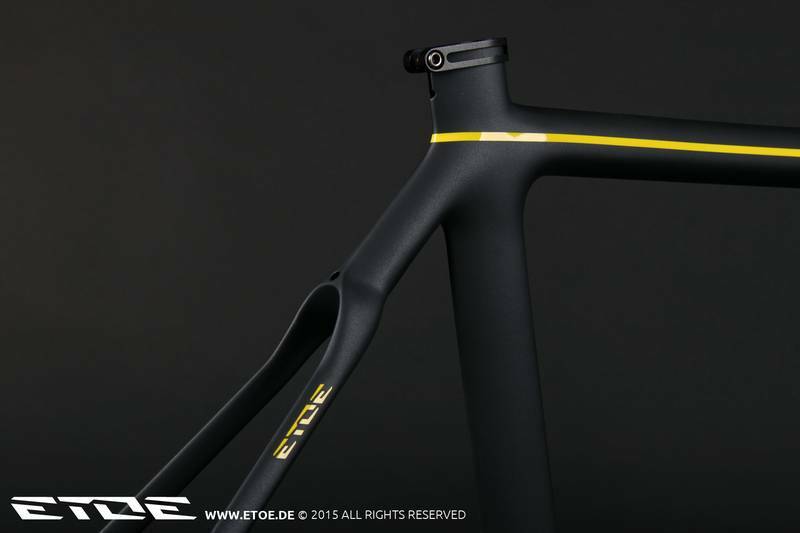 At ETOE you can choose your desired color out of 250,000 color shades or also choose the classic version. 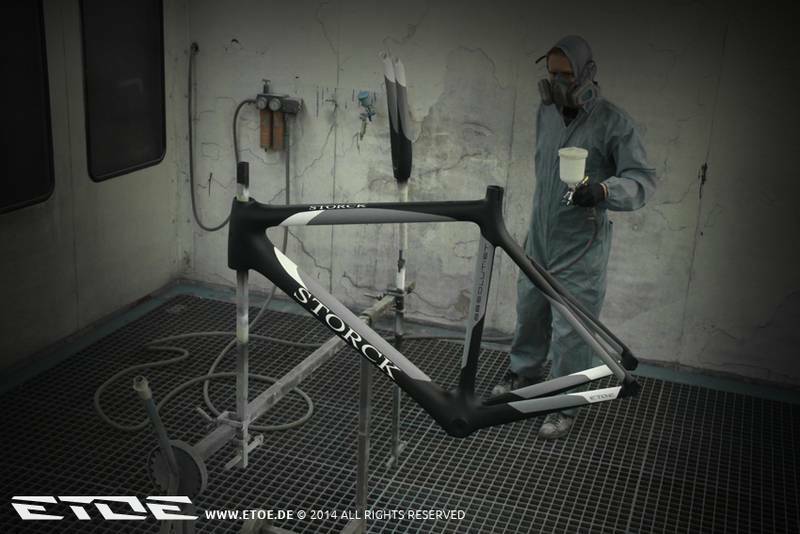 A standard paint usually weighs 120-200g per frame. 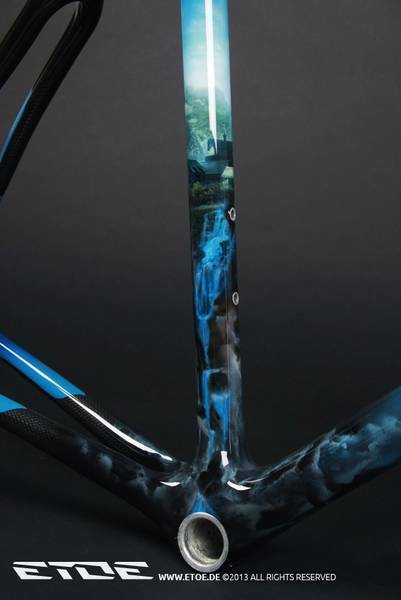 But our paints weigh 10-35g for light paintworks and 35-75g for design paintings! 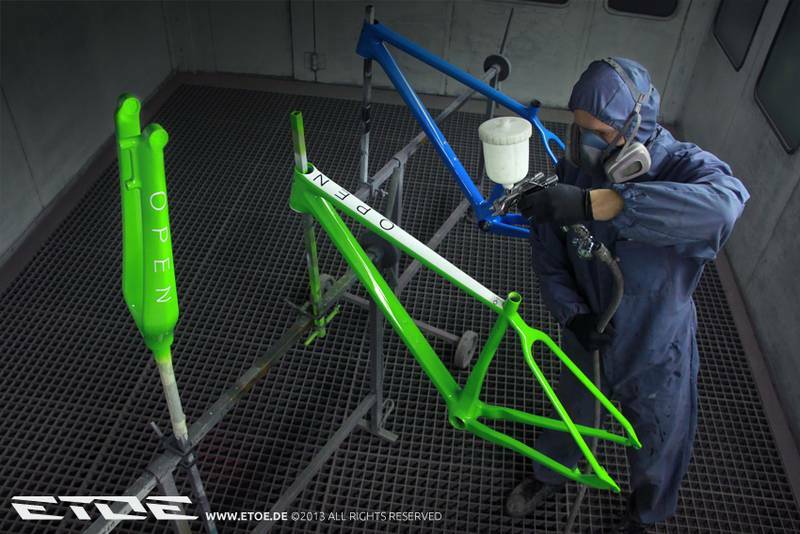 We can mix any color out of more than 250,000 shades of colors. 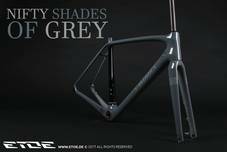 Please give the corresponding color code for your color preference.